Here's another truly hideous 7Axx Franken I've just spotted. So bad it nearly made me puke up my breakfast ! 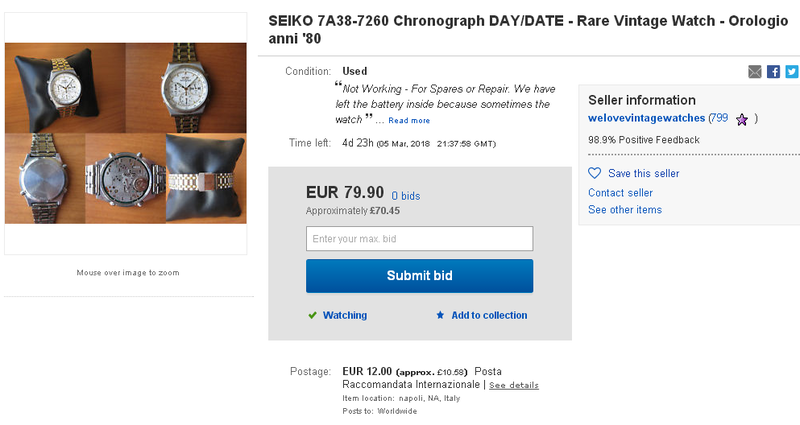 It was listed earlier in the week by an eBay seller from the Dominican Republic - chronodiver_watch, whose username rings a bell (for the wrong reasons). 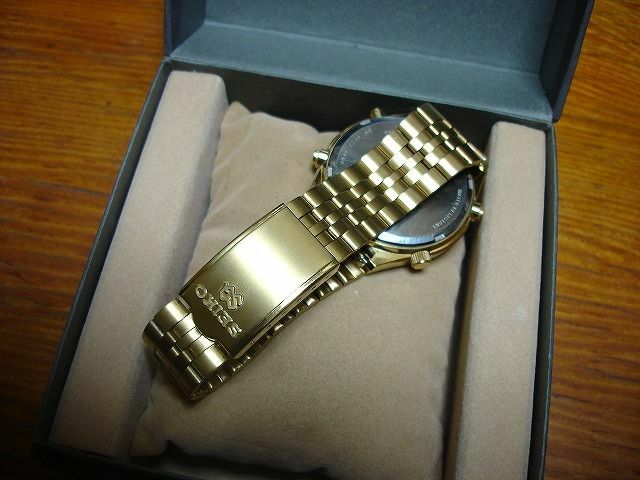 It's listed as a 7A28-7029, which the gold dial, hands movement and case-back are from. 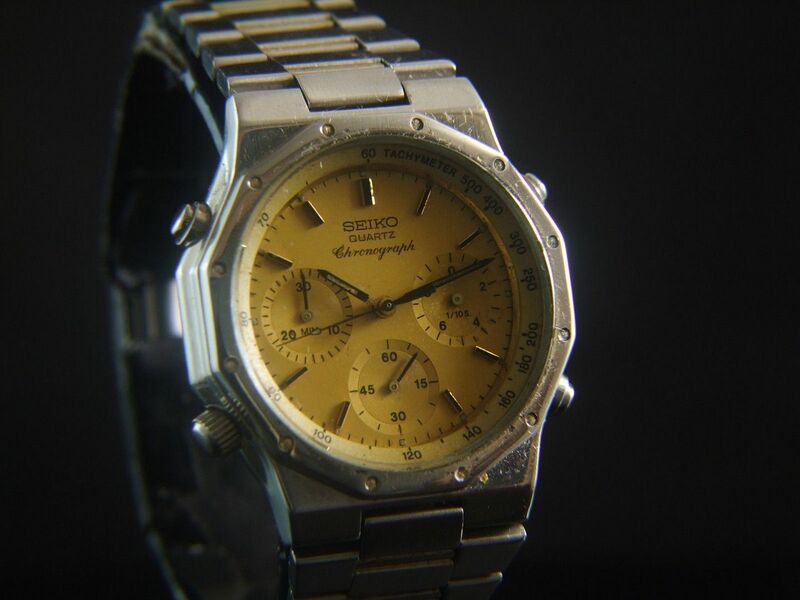 But the well-worn case, (faded) Tachymeter ring and bracelet are I suspect from what once was a two-tone 7A38-702H. 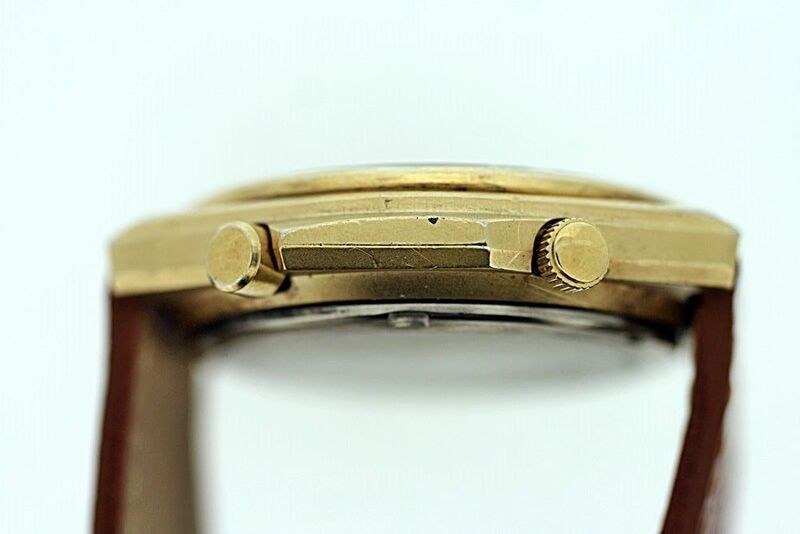 It's been polished to death in the best Filipino watch botcher tradition, but if you look hard, you can still spot the odd trace of the original gold plating. It's also rather grubby. If you really need to see more photos (including evidence of a severe battery leak inside the case-back), there are 15 more photos of this travesty embedded in the description. push button works with no flaws. if you need more info or any Picture please ask glad to help and answer any questions you may have. I do my best to describe each item completely and post clear and detailed photos. 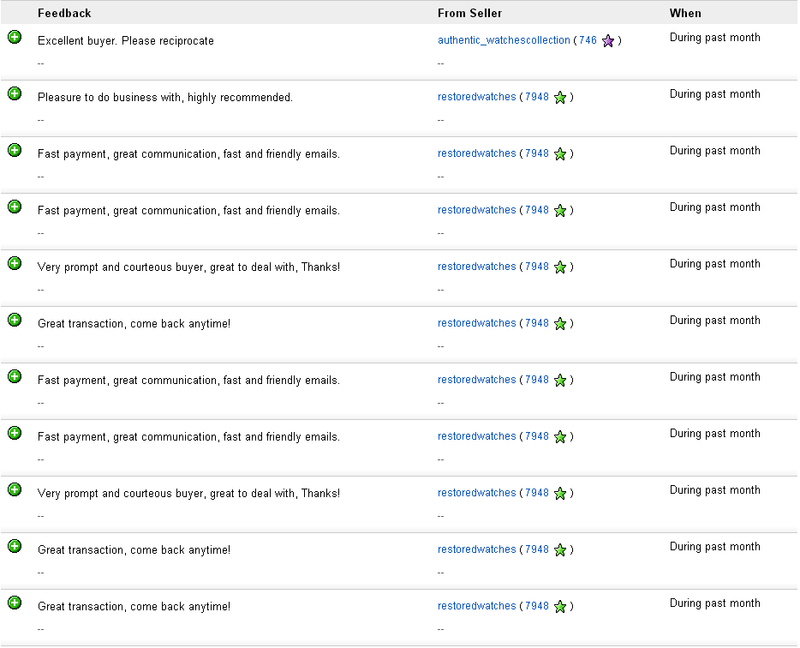 If there is a problem with any item you receive, Please contact me before leaving negative feedback. I should be able to resolve most problems. 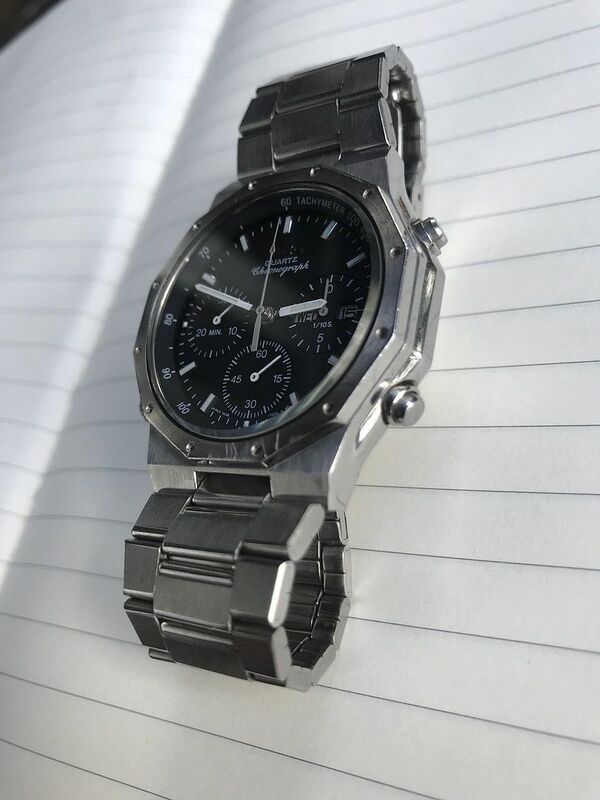 Here's another rather more attractive 7A38-702x based Franken that's very likely to catch out an unwary punter, because it's that desirable combination of an all stainless case and bracelet fitted with a black dial - plus it's also quite subtle. It was listed early this morning by a devious (and greedy) US eBay seller, with an opening bid price of $250 or Buy-it-Now for $400. 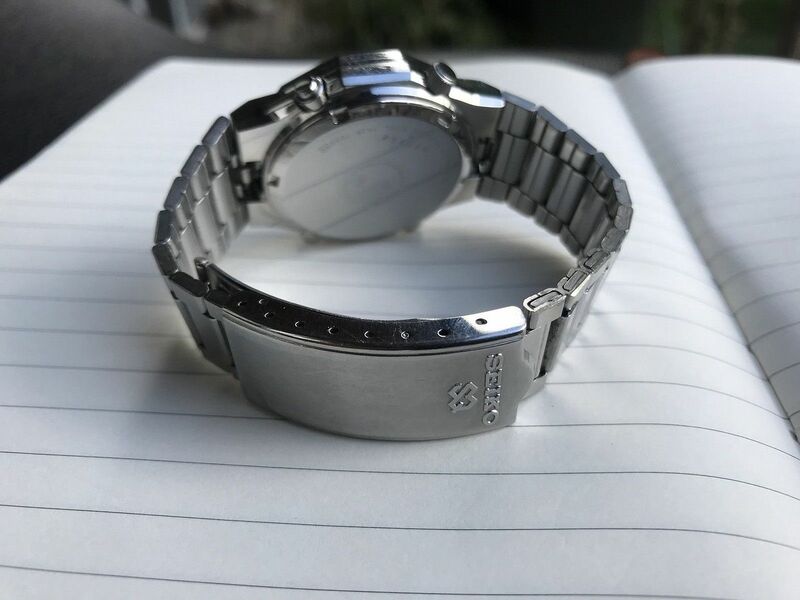 Case and bracelet are obviously from a stainless 7A38-7029 (per the title). 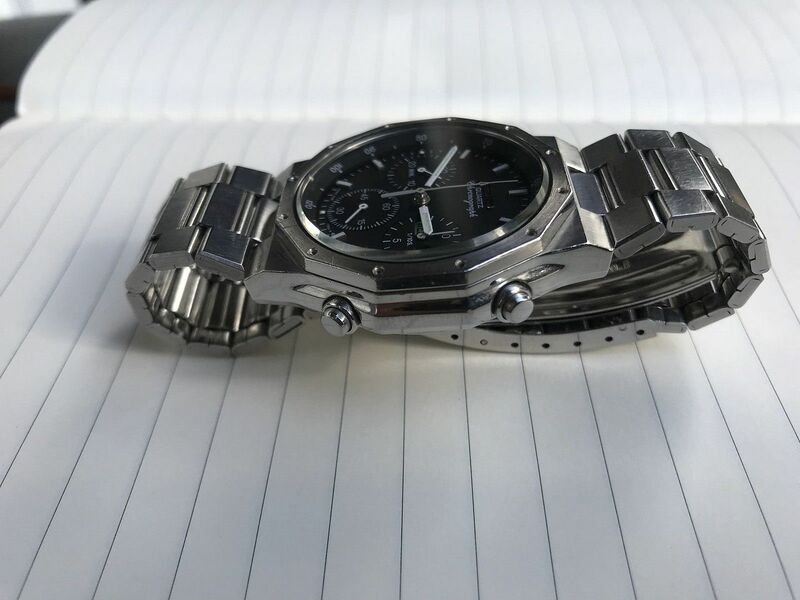 The seller's 3 photos aren't the clearest, but I'm going to stick my neck out and say that the black dial is a 722L from a stainless 7A38-7270. 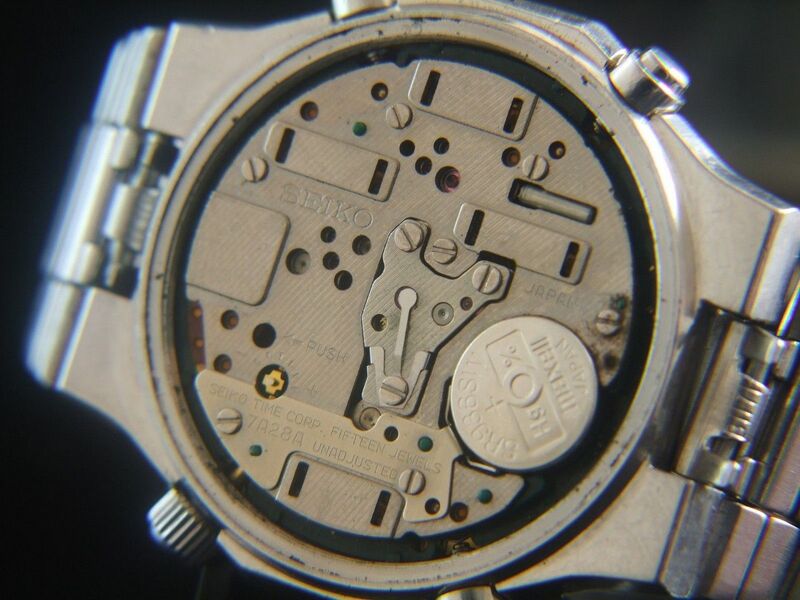 That said, it wasn't just a matter of the seller dropping that dial / movement into the 7A38-7029 case. Oh No. Check out the day / date windows - they're silver with black lettering. The sweep second hand is silver, rather than white. 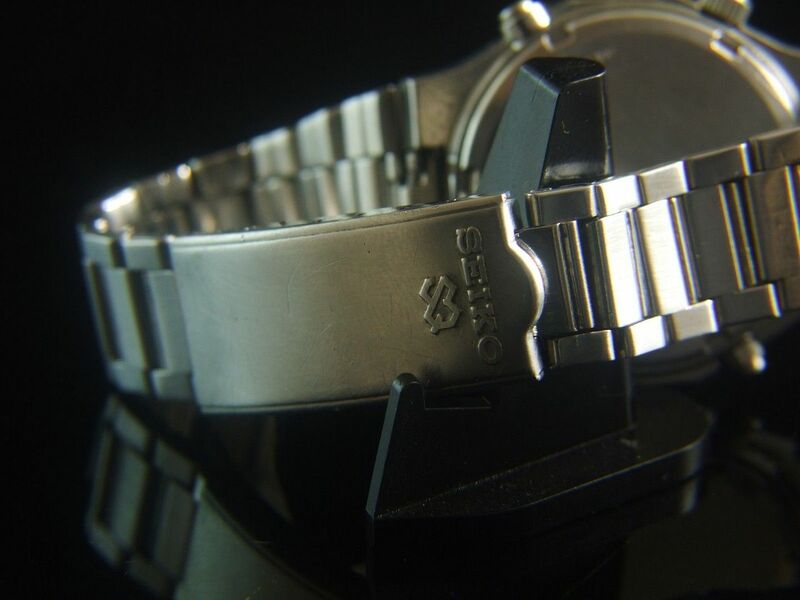 The 1/10s subdial hand is also silver, whereas the other two are white. 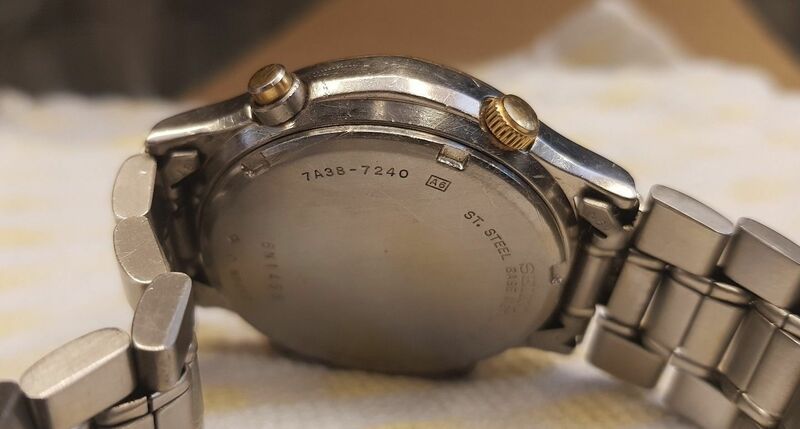 I suspect the hour and minute hands also came from the 7A38-7029 rather than the 7A38-7270. That's all assuming that this Franken is the product of just two donor watches. 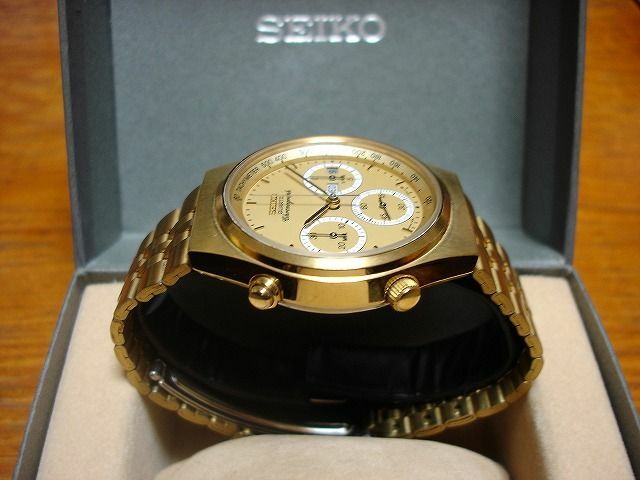 Seiko 7A38-7029 Chronograph Sports 100 Day Date Watch stainless Steel Back. 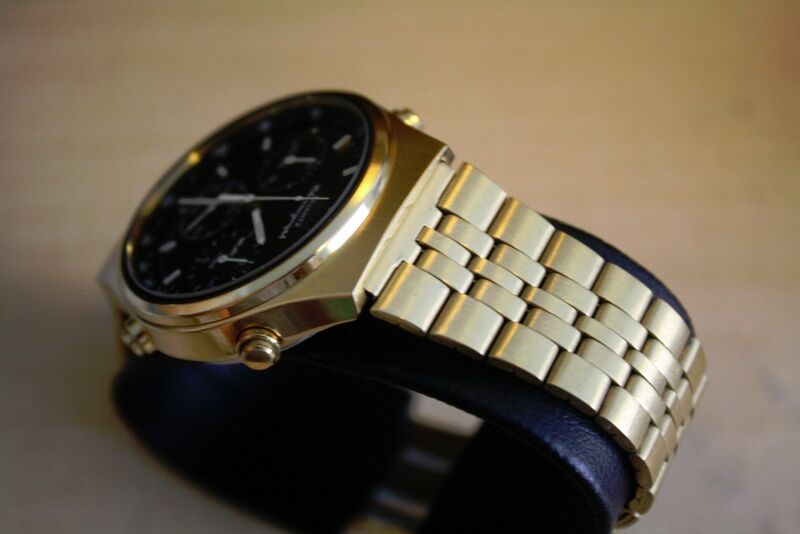 This watch is in excellent physical shape and is fully functional. 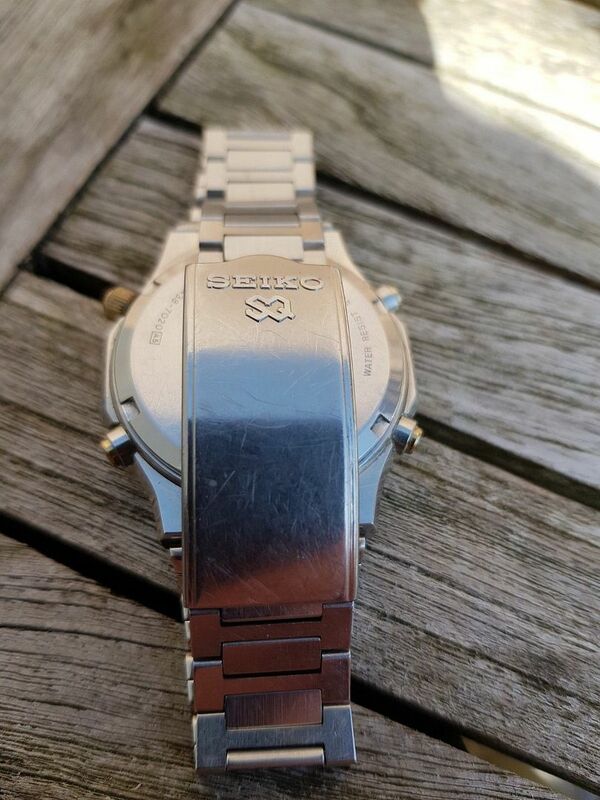 On the back of the watch, there are some some light marks on the stainless steel back from normal use. Crystal is in good shape. It has some light marks on it from normal wear. This watch is water resistant. 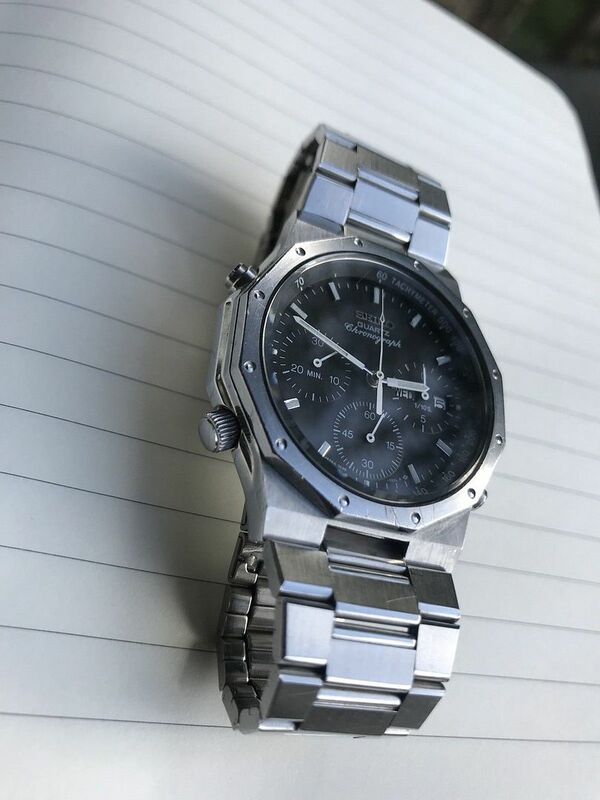 This is a chronograph watch. This will ship first class parcel with the appropriate amount of insurance. 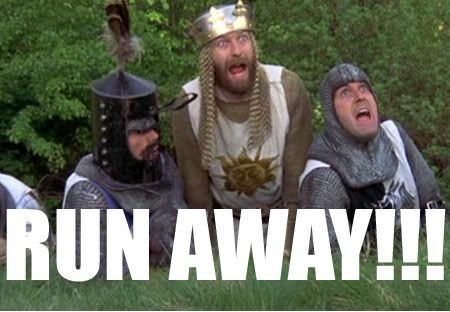 The shipping cost will be a little higher than my normal charge for first class parcel to cover the cost of the insurance. International Buyers, message me before bidding. 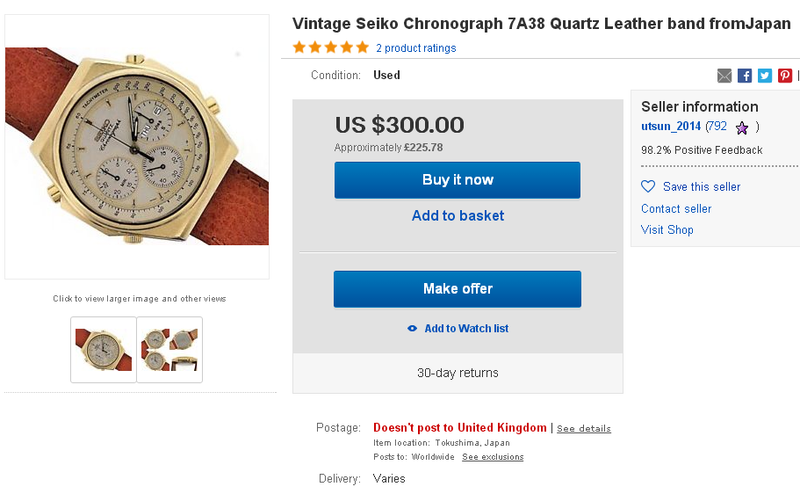 The Israeli seller had re-listed it a week ago, as a 7-day auction, with an opening bid price of $70. I hadn't bothered to post anything more about it, because there were enough warnings about it on the previous page. Or so I thought. I dunno. Turn your back for 5 minutes and the numpties come out in force. I cannot believe that mis-represented piece of cr@p just sold for $80.30. The last 3 bids were snipes, FFS ! Sometimes, I really do think I'm wasting my time by continuing to add updates (intended as salutary warnings) to this thread. That clearly deceptively attractive 7A38-7029 Franken sold earlier this morning for $357 after 2 bids. Both bidders sniped it within the last 10 seconds, FFS ! Here's an interesting one - something I've never seen the likes of before, in nearly 10 years of searching for 7A38's on the Internet. 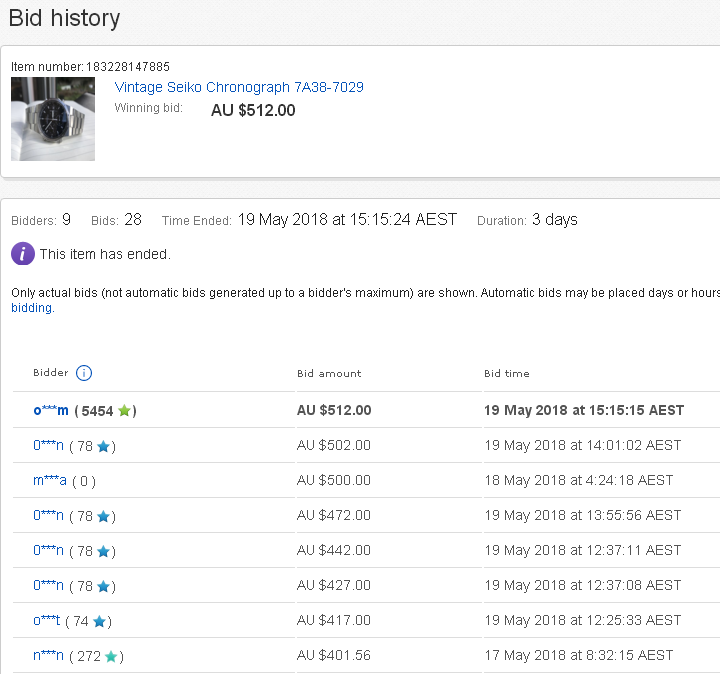 It was listed in the early hours of this morning, by US eBay seller worldwideweb66 as a 5-day auction with an opening bid price of $199. 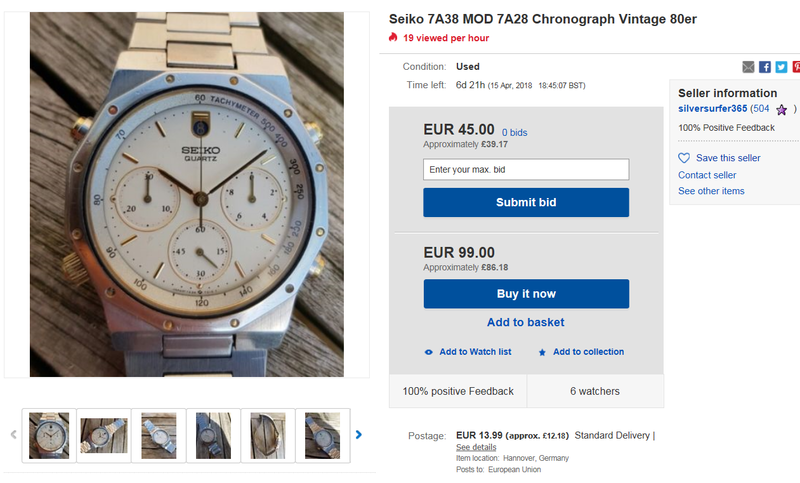 He's trying to pass it off as a 'new' watch - complete with partial hang tag (conveniently missing the label part, which might reveal a hitherto unknown SAA product code) and a period Seiko presentation box. It certainly does look new-ish. 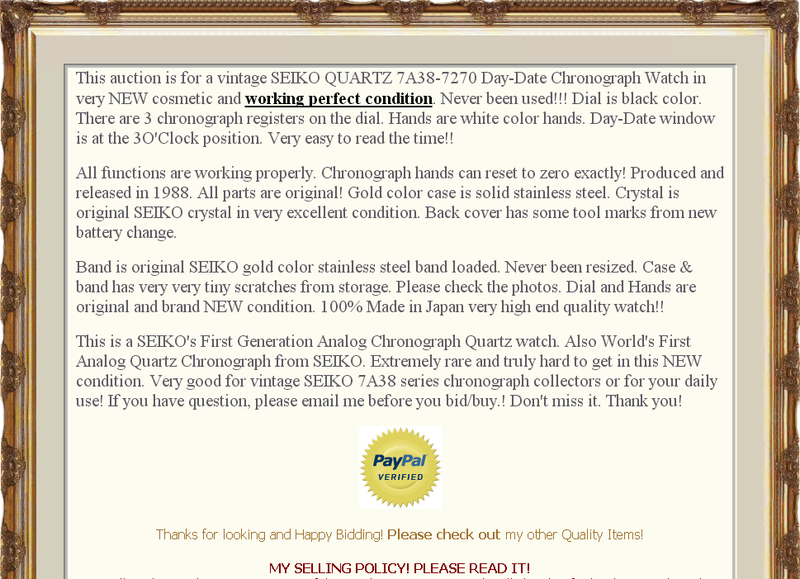 But according to Seiko's database, no such variant of 7A38-7270 exists. 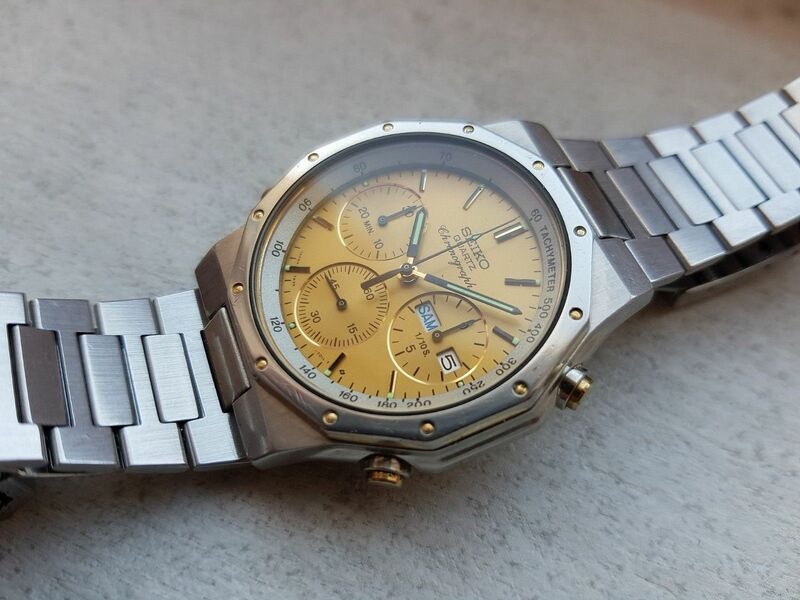 To my eyes, it looks distinctly like the case and bracelet from a gold-tone 7A38-7270 SAA096J, that's been fitted with the black 722L dial and Tachymeter ring from a stainless 7A38-7270 SAA093J. But what do I know. Worldwideweb66 is of course none other than our 'old friend' Wai Phyo, who has graced the pages of this forum section in the past. He's best known as a longtime profiteering re-seller and has his own dedicated thread. Looks like he's branching out into Franken building. He's also been known to be economic with the truth, at times, when it comes to describing his offerings. 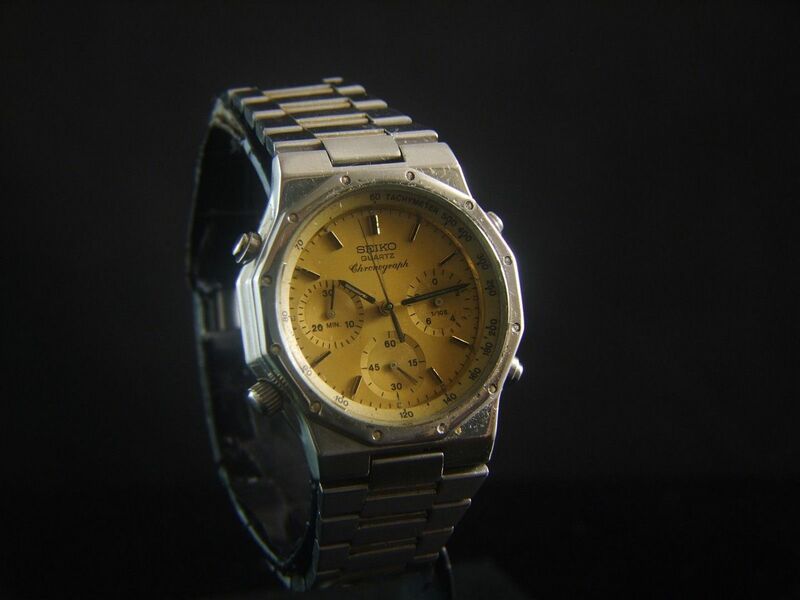 When I get time later, I'll see if I can find any recent evidence of where he bought the donor watches. He's not usually very good at covering his tracks. Note the commonly-used half-truth in the description - All parts are original ! 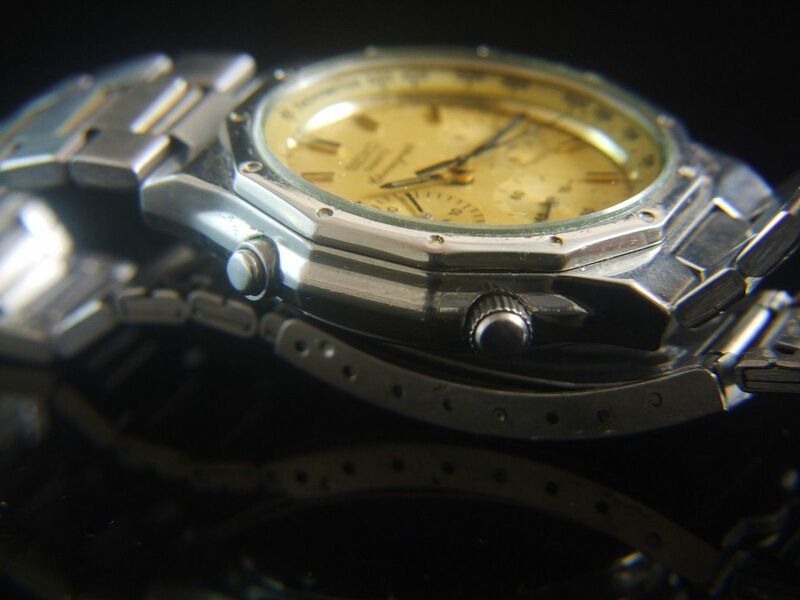 Yes, they may well all be original - just not original to this one particular watch. I haven't had much time to dig into it, but I'll have to admit Wai Phyo's 7A38-7270 Franken has me scratching my head for the moment. One thing I am convinced of is that it's definitely a Franken. 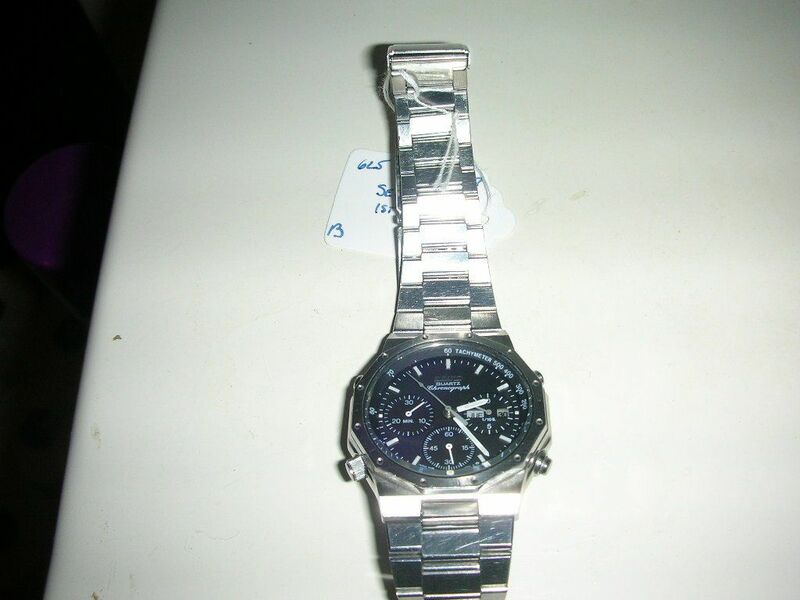 What I'm having trouble establishing is where he got the donor watch from. 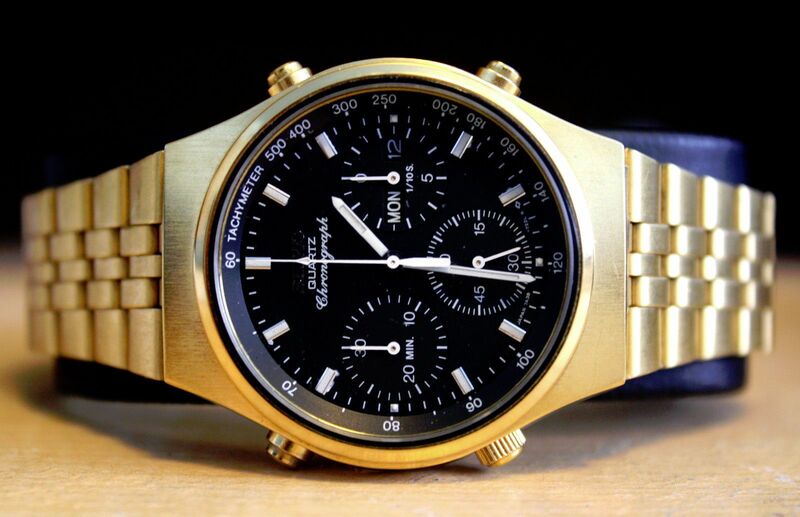 There were a few gold-tone 7A38-7270's listed on eBay in the States last year, but most had worn gold plating to some degree. The only example I can find, in similar almost 'new' condition turned up on Yahoo Japan auctions at the end of January (this year). There are scoldings and scratches on the back cover. Back cover has some tool marks from new battery change. That said, without a case-back serial number, or sight of the scratches, it's nothing more than just coincidence. Even if it actually is the same gold-tone 7A38-7270, obviously there's no way of tracing the YJ winning bidder's ID back to Wai Phyo. However, if it is, one thing bemuses me. 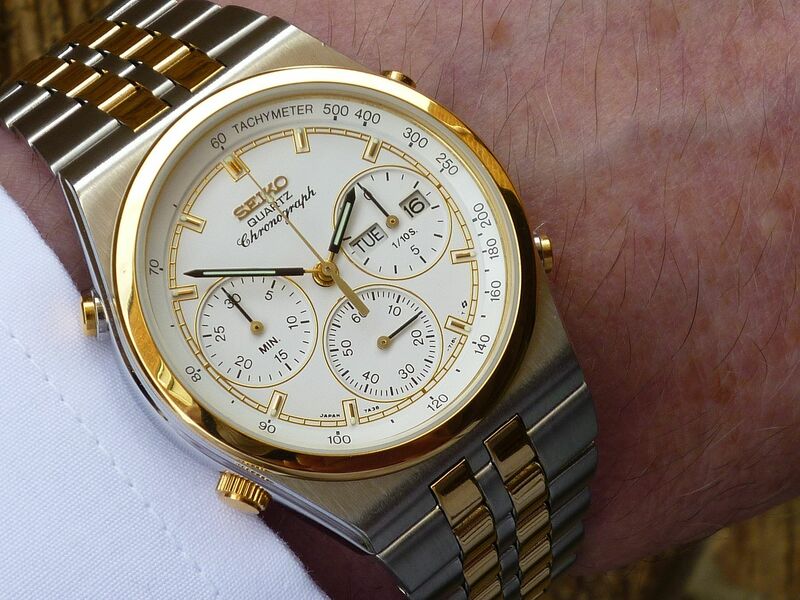 The 7230GX14 gold dial is probably the least attractive of any 7A38-727x dial, by dint of those white sub-dial rings. That said, it is the correct dial for this case model. So why anybody would want to swap it for a black 722L dial to create a Franken, in what has to said is rather dubious taste, regardless of how 'new' it looks, is completely beyond me. That eBay auction listing by US eBay seller worldwideweb66 ended in the early hours of this morning, with this highly unusual gold-tone 7A38-7270 Franken selling for $305 after 10 bids. I must admit I was tempted to bid on it at one stage - not for its own sake, but to break it up for its constituent parts. 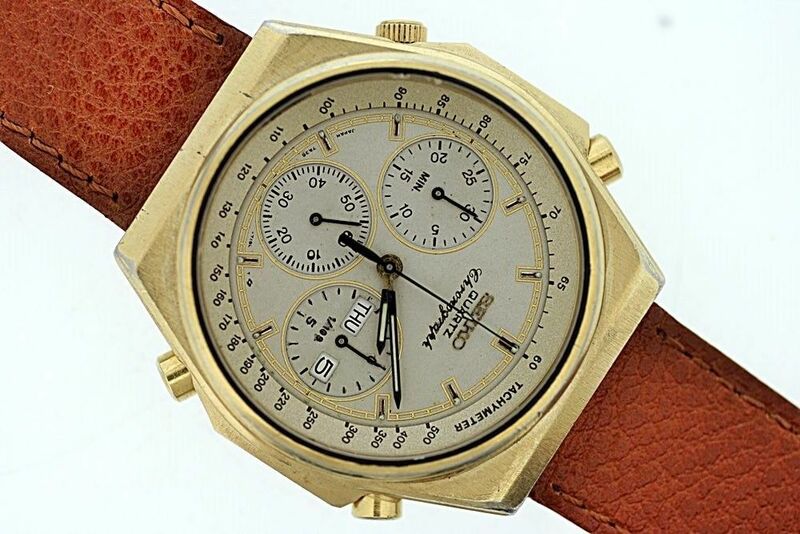 The gold-tone case was in better condition than my own (original) example - and I'm sure I could have re-homed that black 722L dial somewhere. But one thing's for sure - by abstaining from bidding, I'm confident that I haven't missed out on an extremely rare variant of 7A38-7270. 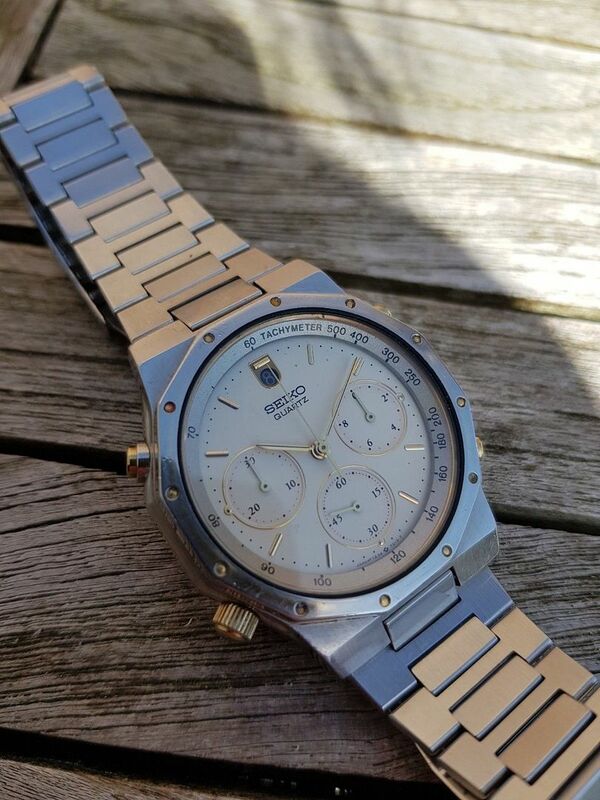 This hideous mess, purporting to be a 7A38-7260 was listed a couple of days ago by Italian eBay seller welovevintagewatches, who from my personal experience are some of the worst watch botchers on eBay. In truth, this is nothing more than a pile of bits they've thrown together in an attempt to make a sale. 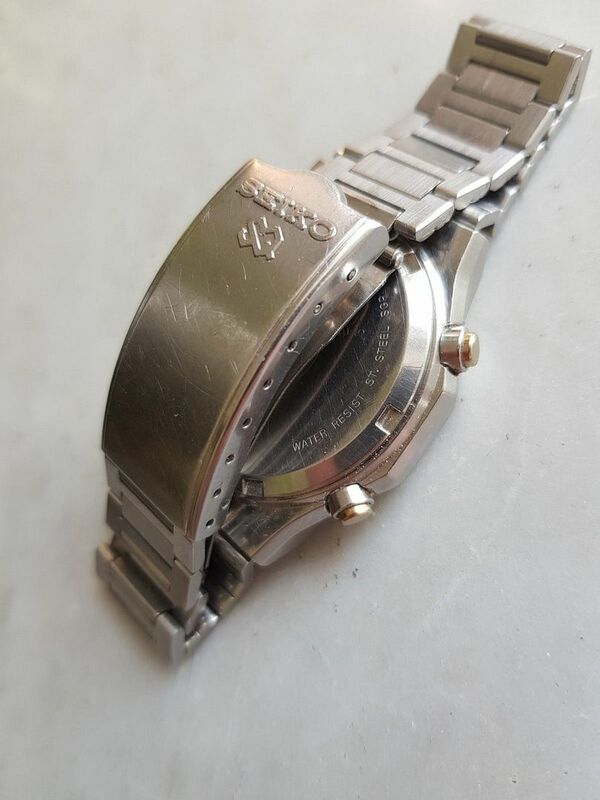 It's the watch case from a stainless 7A38-7280, fitted with the white 718L dial from possibly either a gold-tone 7A38-7260 or 7A38-726A and oddly the case-back from a two-tone 7A38-7260, topped off with some unidentified ill-fitting, cheap and nasty two-tone bracelet. Oh - and it doesn't work !! 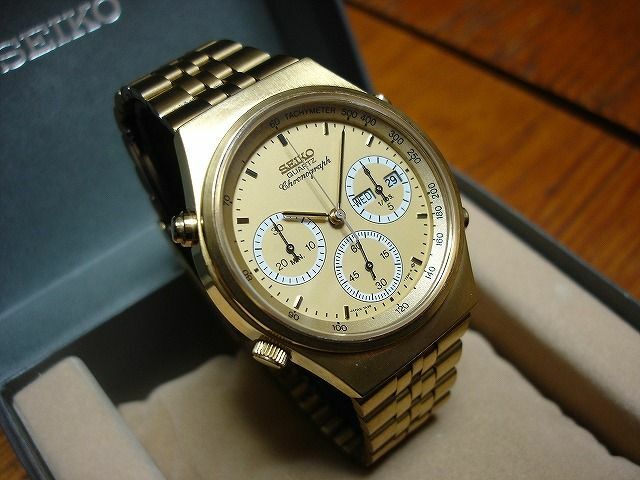 SEIKO 7A38-7260 Chronograph DAY/DATE - Raro Orologio Vintage degli anni '80. NON FUNZIONANTE - PER RIPARAZIONE O RICAMBI. Abbiamo lasciato la batteria all'interno perchè qualche volta l'orologio funziona (anche il chrono) ma qui è venduto come NON FUNZIONANTE. Cinturino in Acciao in buone condizioni. Ci sono pochi piccoli graffi e segni su cassa, vetro e fondello. 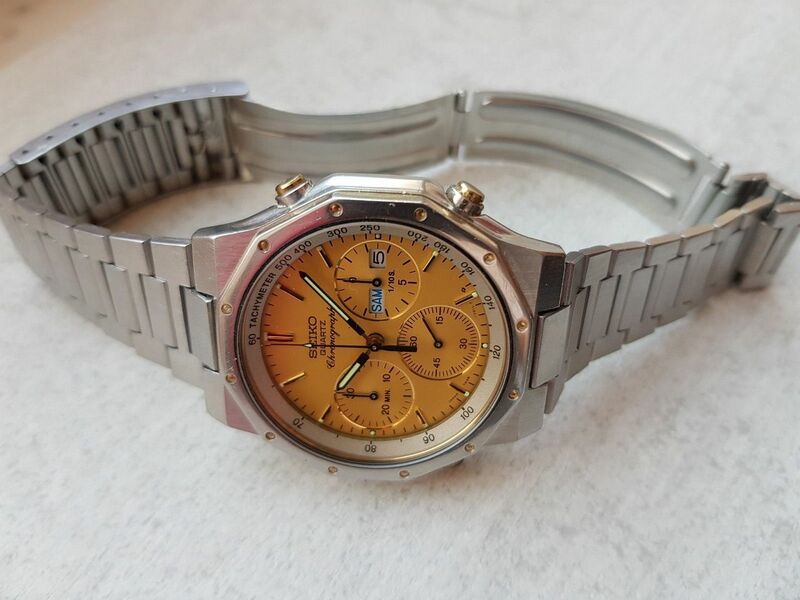 SEIKO 7A38-7260 Chronograph DAY/DATE - Rare Vintage Watch from the 1980s. NOT WORKING - FOR SPARES OR REPAIR. 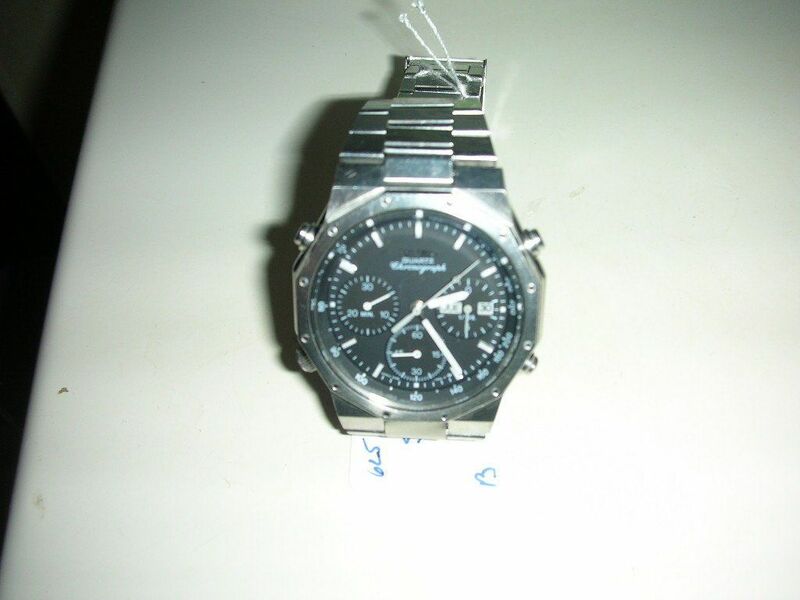 We have left the battery inside because sometimes the watch works (also the chrono) but here it is sold as NOT WORKING. 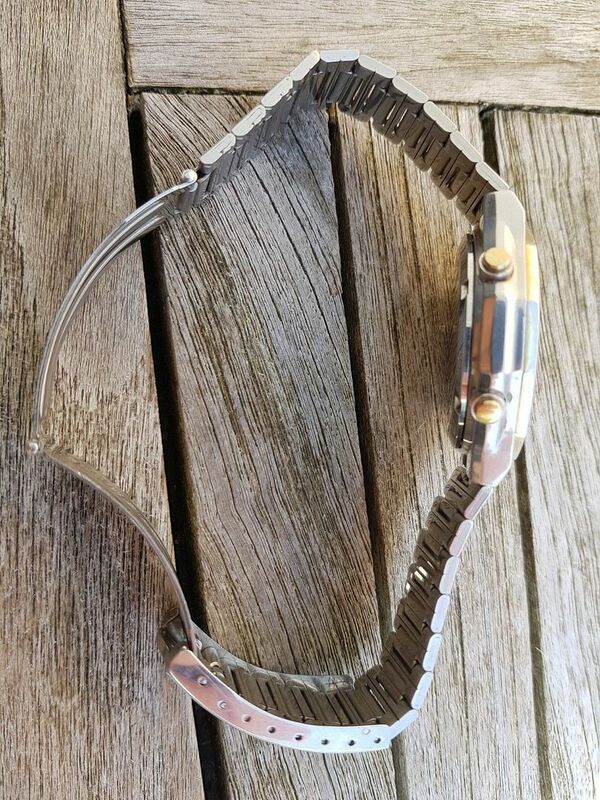 Stainless Steel Bracelet in good conditions. There are few little scratches and marks on the case, glass e case back. Thing is, if built properly, with a little thought (and some decent parts to start with) the white 718L dial (from the 7A38-7260) can look quite attractive in a two-tone 7A38-728x case - as a Franken. Here's one I nailed together myself, a few years ago - obviously with a bit more care. The fact that I'm a couple of days late in flagging up this hideous 7A38 Franken will make absolutely NO difference. 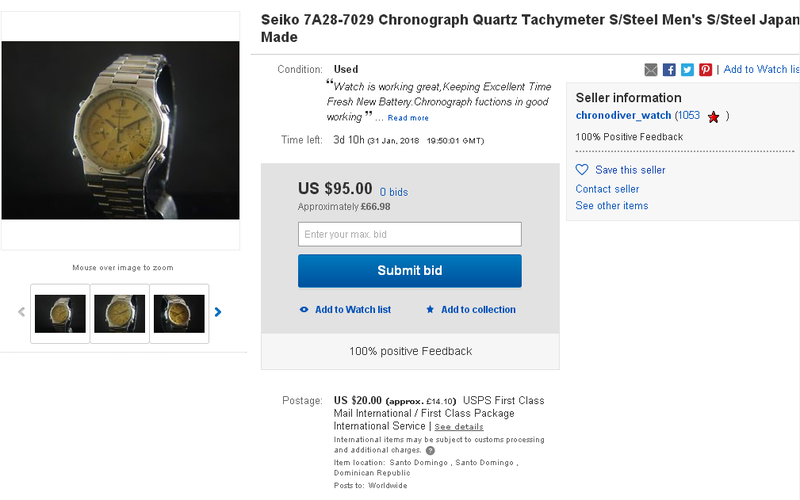 There will always be some idiot(s) who bid on junk like this. 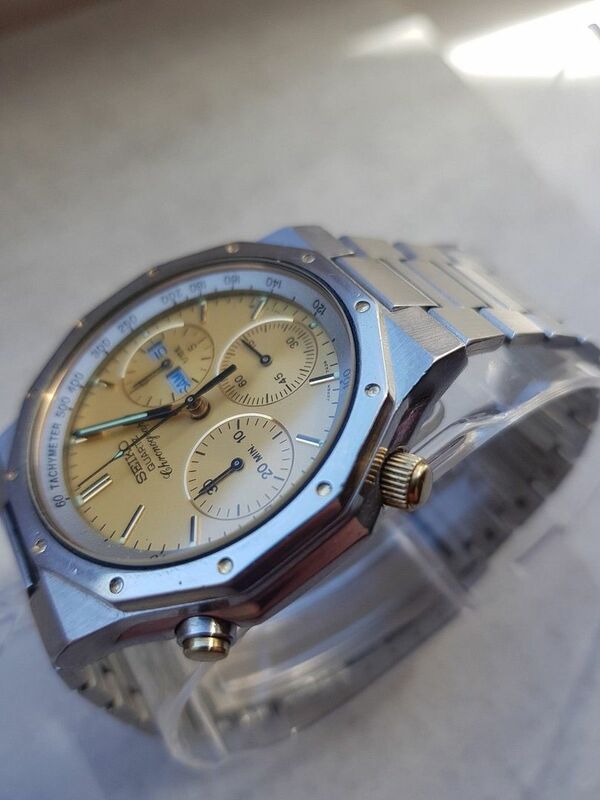 This mess, purporting to be a gold-tone 7A38-7000 was listed a couple of days ago by the wholly inappropriately named arch Filipino watch botcher restoredwatches a.k.a. jfm_watches and nippontime (real name John Dizon). 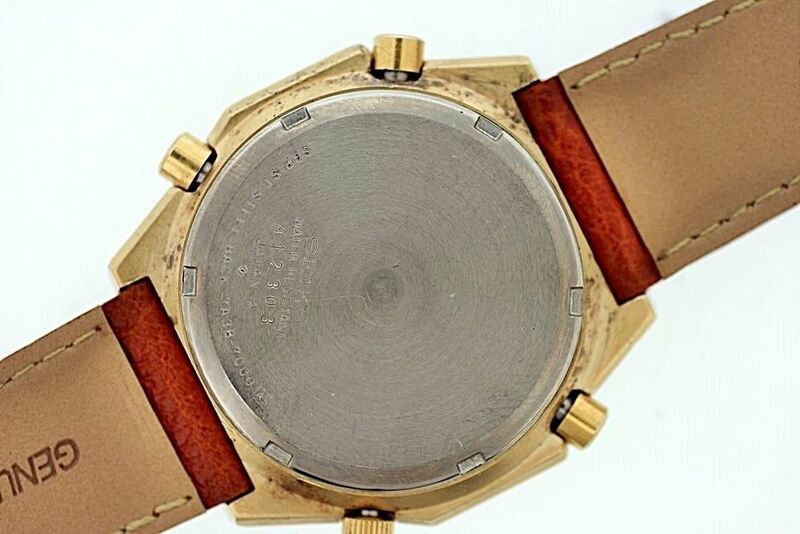 The well worn pock-marked case, complete with typically almost obliterated case-back, may be from a gold-tone 7A38-7000, but the scabby light grey 718L dial is from a 7A38-7260. I strongly suspect the crown isn't original (to this watch) either. 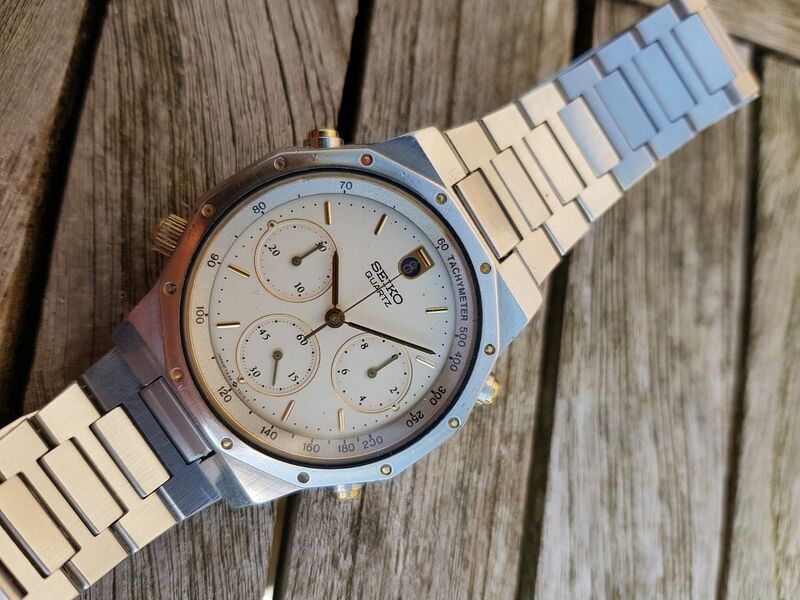 All topped off with a plush cheap and nasty leather strap. 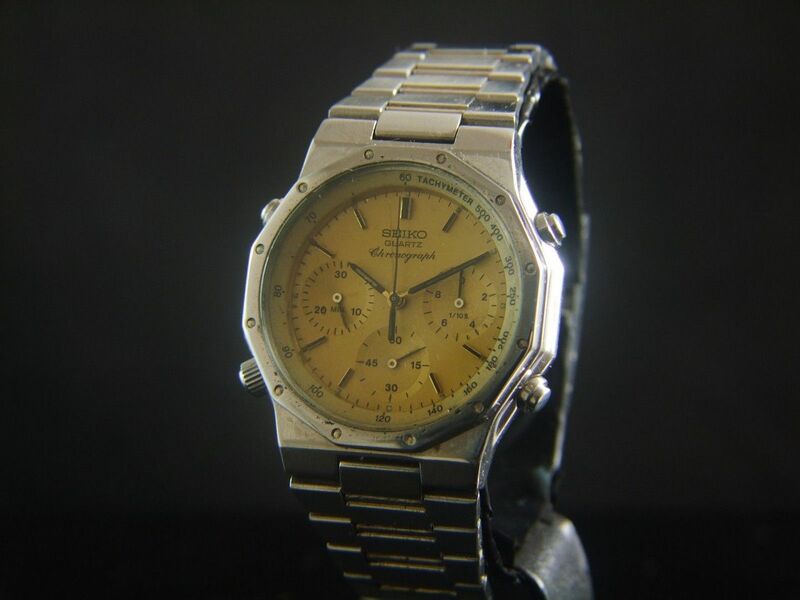 Dial: Seiko Silver Dial, marked Seiko Chronograph Quartz Japan, radium hour, minute, and second hands, , hands and indices are in good condition, inner bezel in good condition. dial is in good original condition. 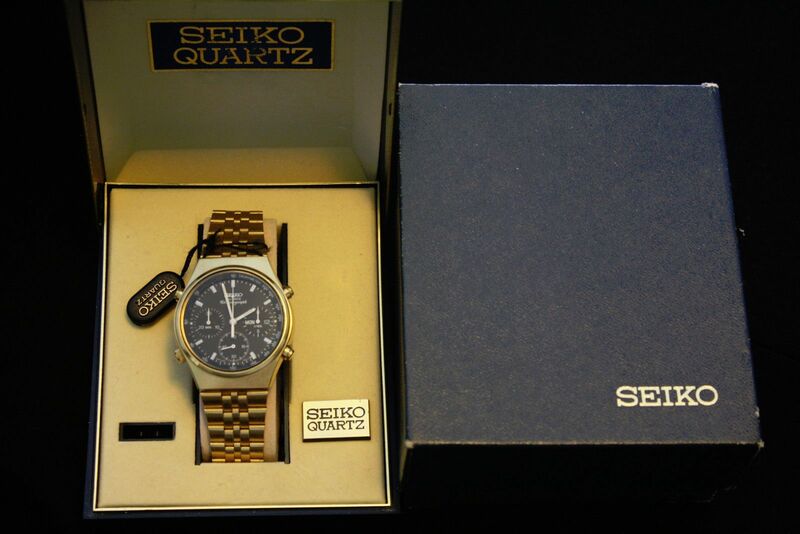 Movement: High grade Seiko quartz powered cal. 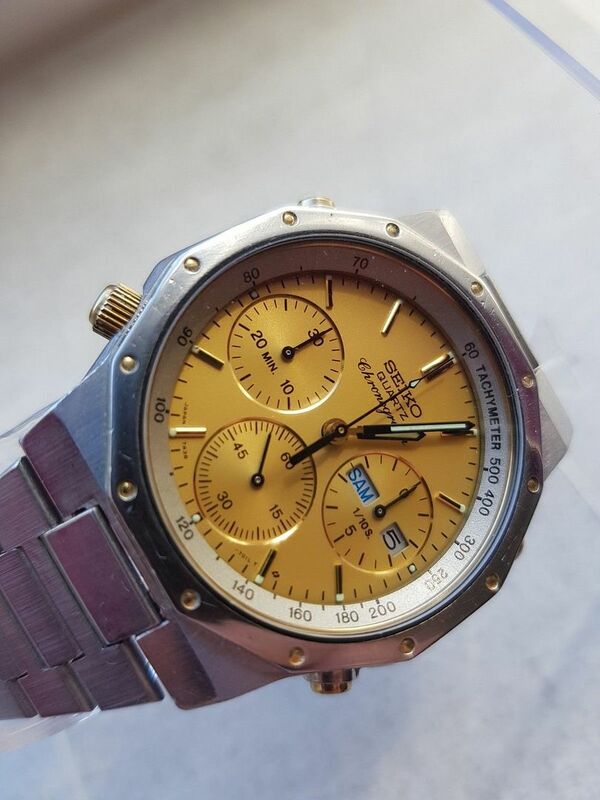 7A38 movement with day date and chronograph feature, has just been cleaned and serviced, a $50 value at no cost to you, runs strong and keeps good time. 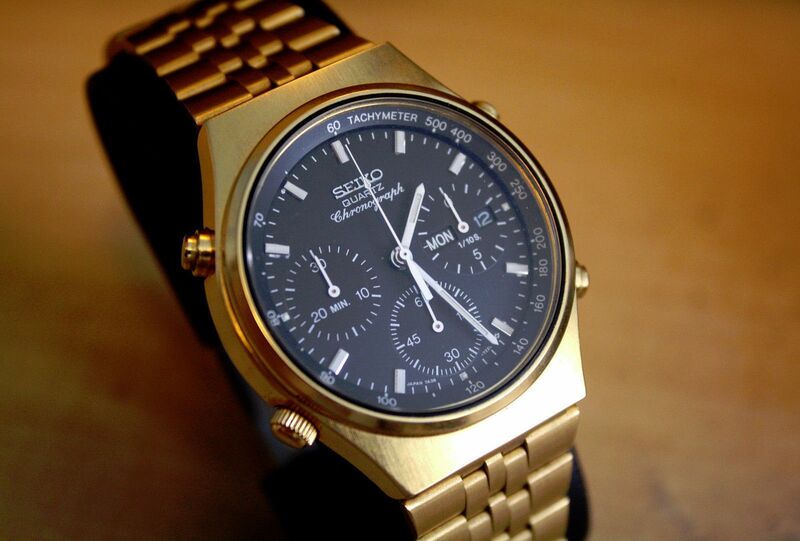 Case: Seiko gold plated case, measures 37 mm. 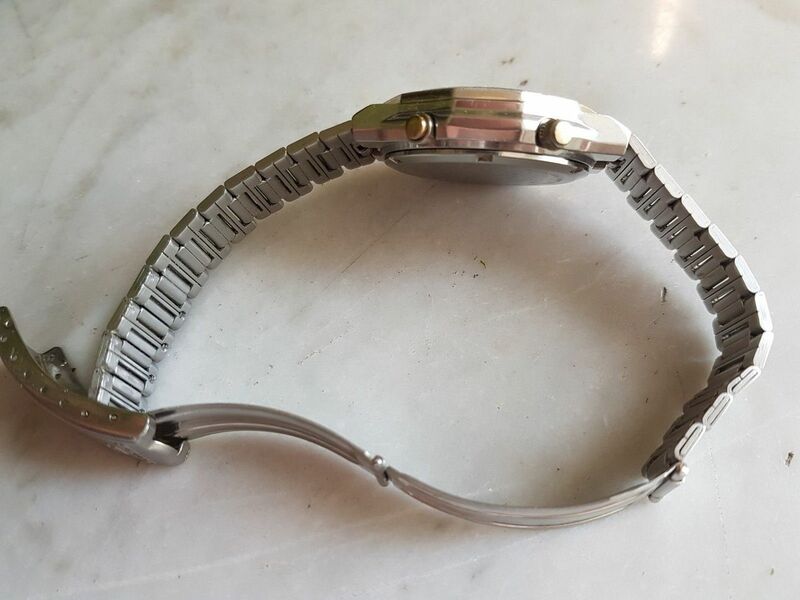 without crown, 41 mm. lug to lug. 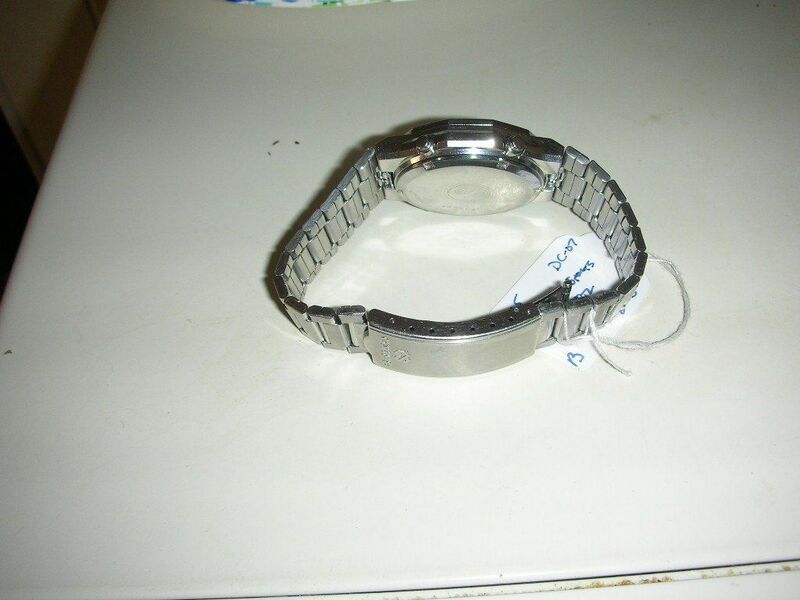 bezel and case with plate wear and is in fair/good condition. Bracelet: New plush aftermarket leather band. Crystal: Mineral Crystal in good condition. 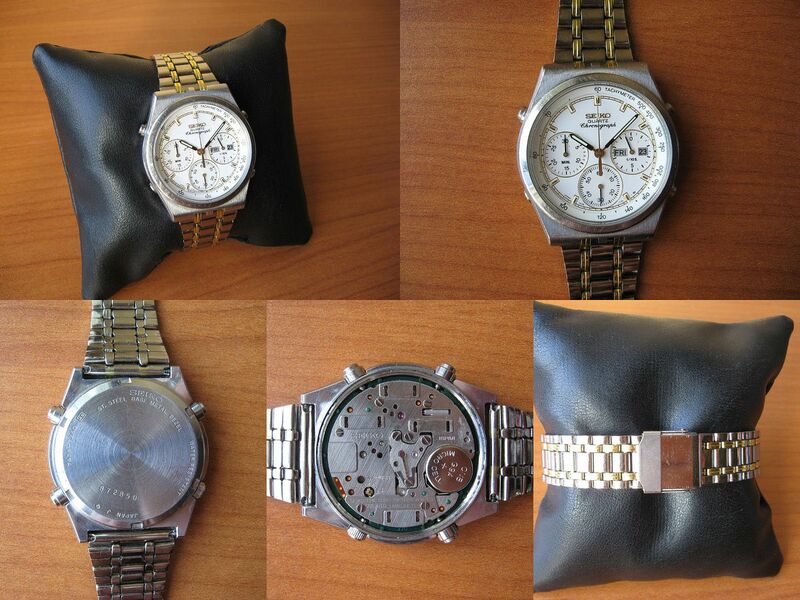 Crown: Seiko crown and pushers with plate wear and is in fair/good condition. 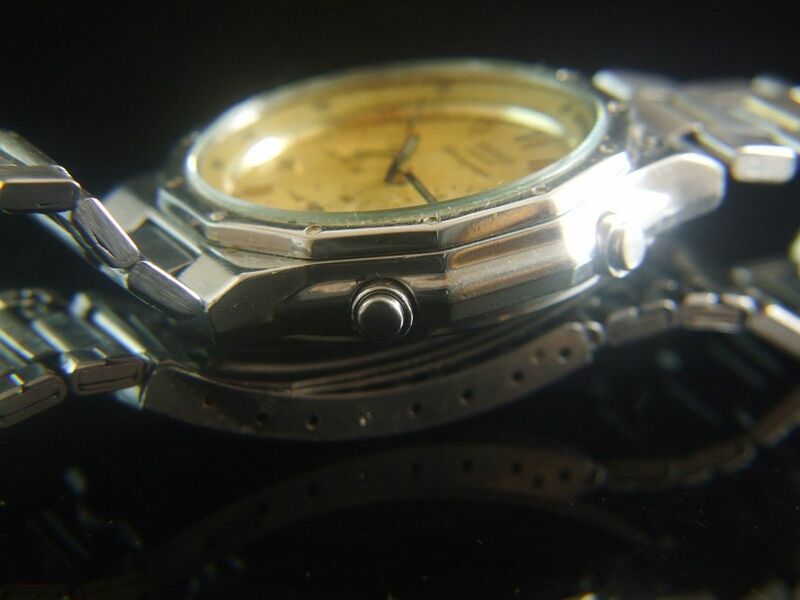 Overall: Watch is in good overall condition. 7A38-7020 Mod. mit Werk und Elfenbeinoptik Blatt aus einer 7A36. Die Uhrzeit und die Datumschaltung funktionieren absolut genau. 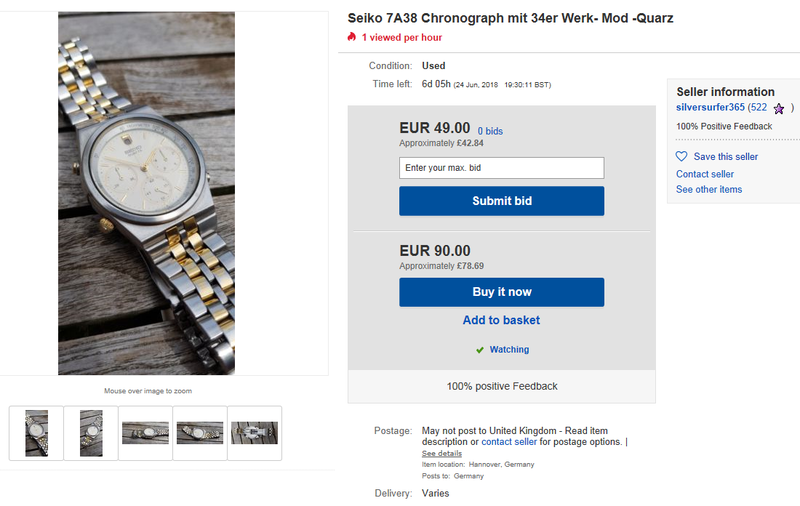 Das Seikoband passt gut an das Modell und sieht dem original ähnlich. 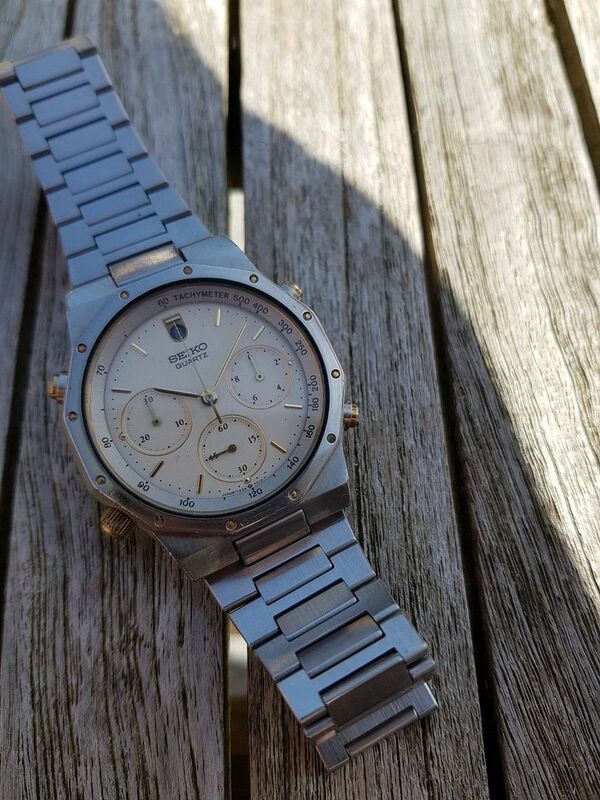 Eine schöne Trageuhr für wenig Geld ohen Rücknahme und Garantie. Watch and date are running great, Stopwatch not. 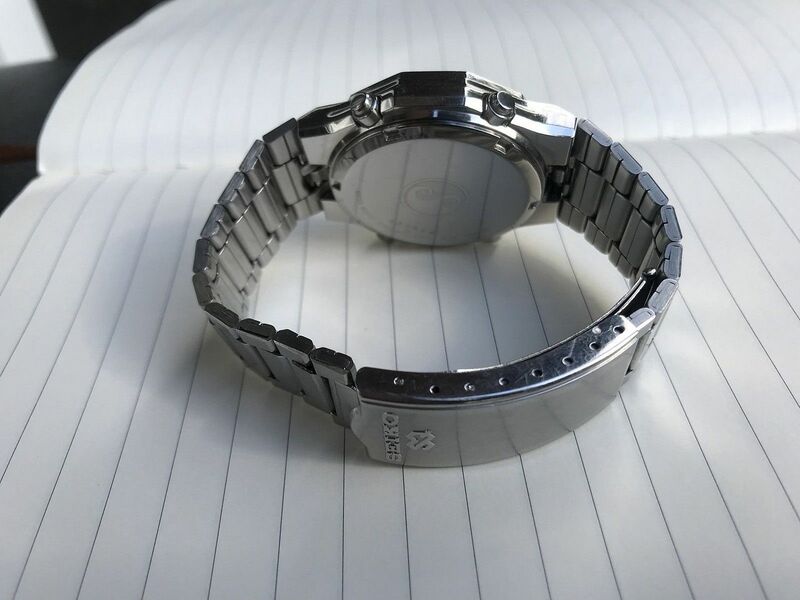 The watch is neither a 7A28 (included in the title), nor a 7A36 (Surf Timer) per the description. 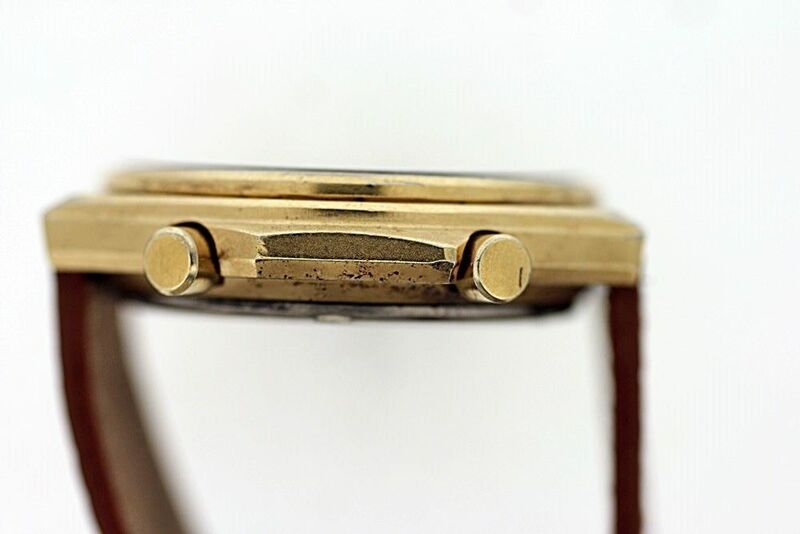 It's a well-worn two-tone 7A38-7020 case fitted with the dial / hands / movement from a partially working 7A34-7010 - on a non-original bracelet. A complete and utter Franken, in other words - not even a very good one at that. It is not a Frankenstein, maybe not a MOD, it is art. I guess we'll agree to differ on that one, Carlo (and about it being 'super cool'). Good to see that you've since added an amendment to your description though. Der super coole spassige Frankenmod hat ein Werk aus der 7A34-7010 drin, nicht von ein 7A36 wie erst oben geschrieben. Nur der ordnunghalber. Gell Paule. Anyone still following this thread (I think there's a few) will probably have noticed that I frequently don't bother adding updates when one of these Frankens sells. It's not that I don't care, it's simply a matter of time / priorities - and like I said, there will always be some idiot who ignores my advice, bids on and and ends up buying misrepresented botched-up junk like this. There are however another group of eBayers who knowingly buy Franken junk like this: the dealers / profiteering re-sellers. Probably the worst offenders of this despicable genre was the now defunct Timely_Classic, who thankfully disappeared off the scene 5 years ago. So obviously, I hadn't bothered checking the ID of the winning bidder, either. Not difficult to figure out that the encrypted ID c***6 (1149) is mcn260 (1149). As you can see, he hasn't bothered taking any photos of his own, instead just re-using some of the Filipino eBay seller's images. 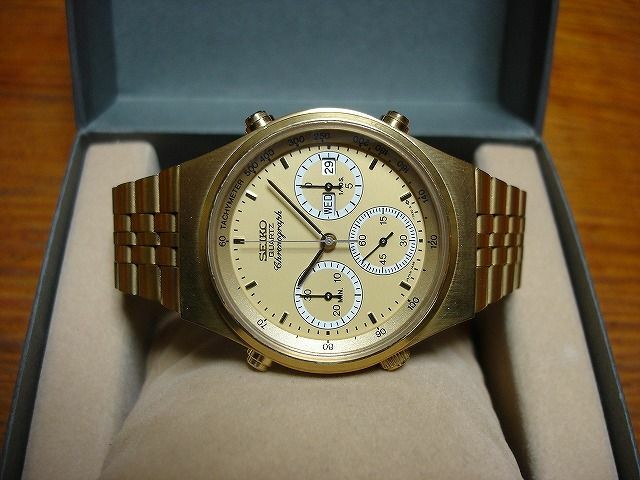 The laughable opening bid price of ¥18,000 Yen equates to $164.50 USD at today's exchange rates. 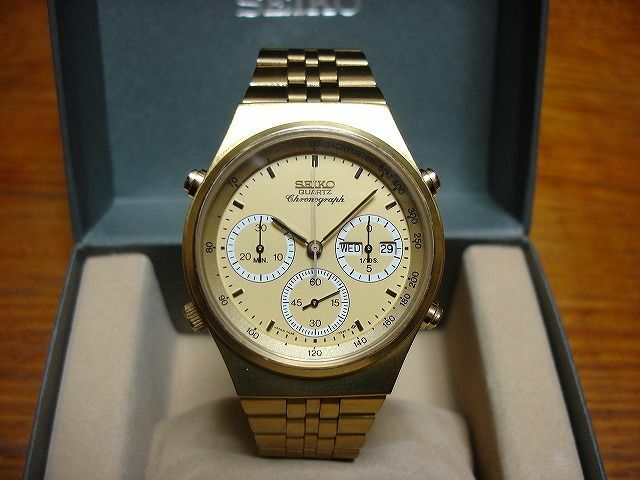 It becomes Seiko · chronograph overseas model "7A38-7000" made in 1984. 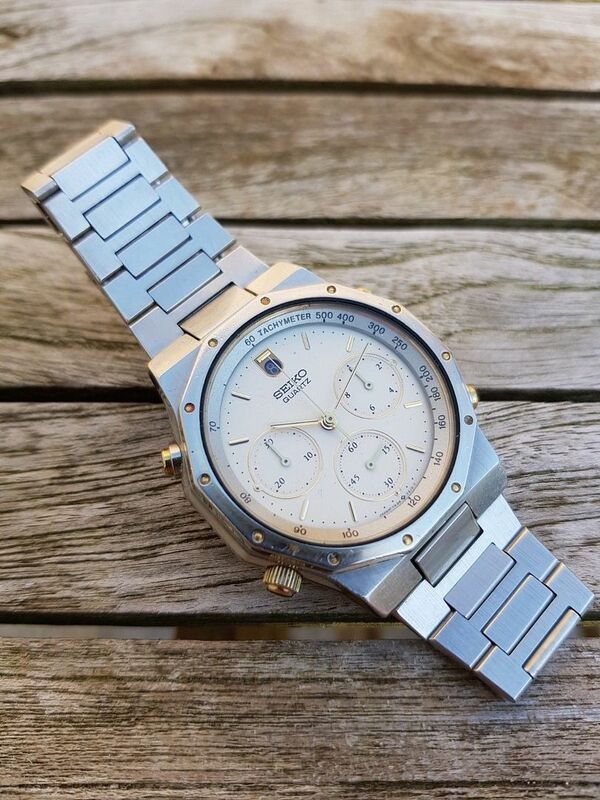 7A38 became the base of the Giugiaro model It became the top model of 7A28 which was released as the world's first multifunctional analog quartz watch in 1983 . 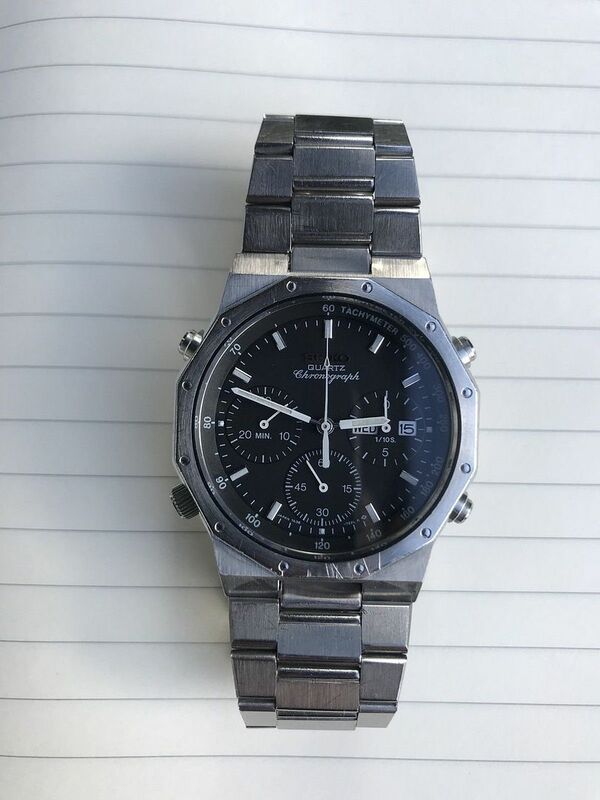 Chronograph (Split measurement is also possible) Calendar etc. 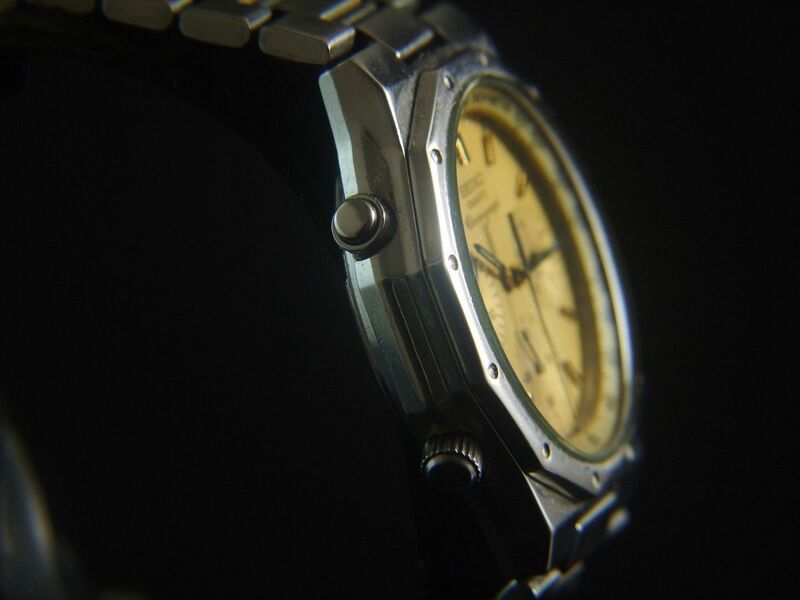 At that time it is the best performance watch. You can modify the day of the week and day by subtracting one crown. Day of the week display will be English and Roman numerals. Shipping method is only Sagawa Express former payment. Enclosed dispatch is possible. 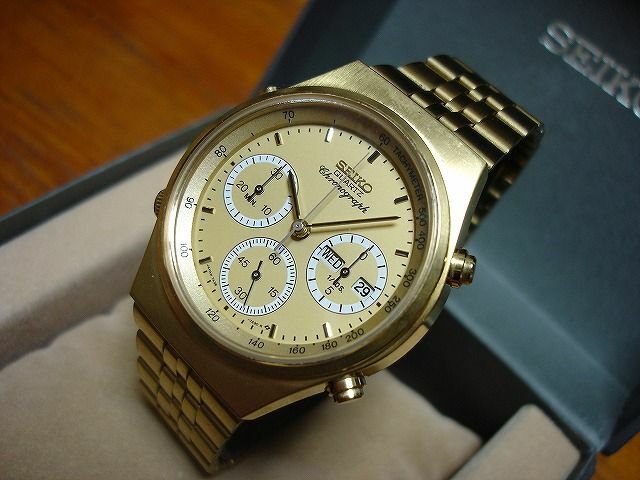 Even if the watch is bid successfully, the shipping fee will be uniform. * If you live in Okinawa Prefecture and Honshu, Shikoku, Kyushu, Hokkaido, please contact us for shipping costs. Appearance: I think that it is a relatively good condition for old things. Operation: Battery remaining capacity can not be guaranteed but it works. Even if there is no issue at the time of sale, if a defect is found, I will indicate it in the additional notes so please read the text to the bottom of the explanatory note of the postscript. 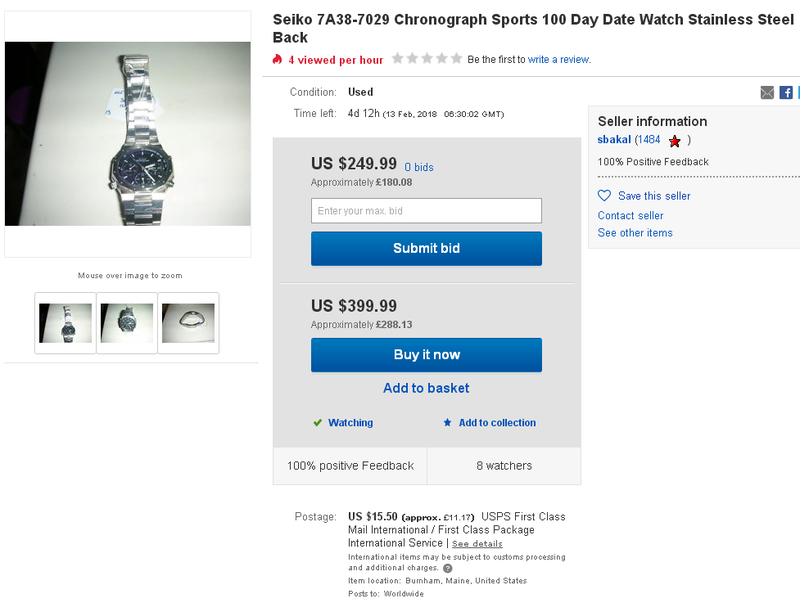 Despite the previous US eBay seller's poor quality photos, I think it's fairly safe to assume this is a case of Déjà Vu. Scroll back up the page to my posts dated 8th and 13th February to see where it previously featured in this thread. 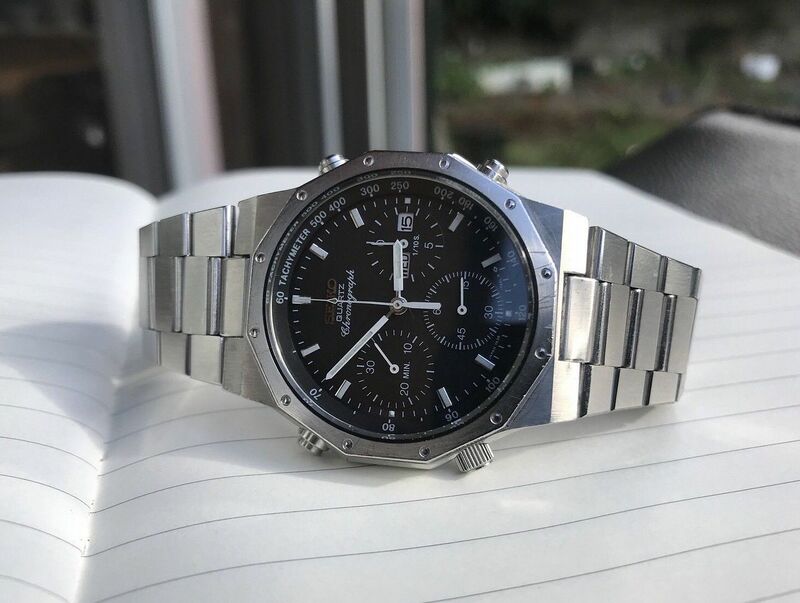 This stainless 7A38-7029 Franken, fitted with the all-black 722L dial / movement and hands from a stainless 7A38-7270, was listed earlier today by an Australian eBay seller, as a 3-day auction, with an opening bid price of $99.99 Au. What makes me so sure it's the same watch ? 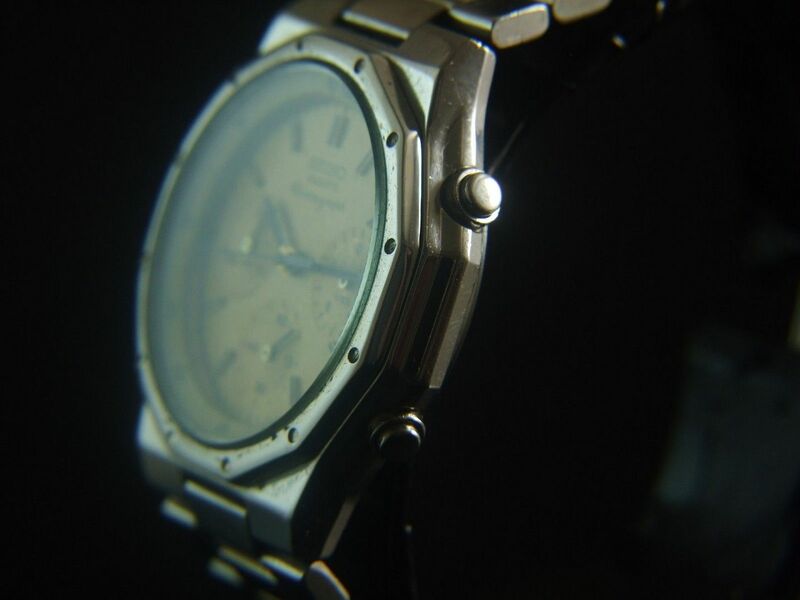 Well one thing they share in common is that overly thick non-standard crystal which protudes well above the bezel. 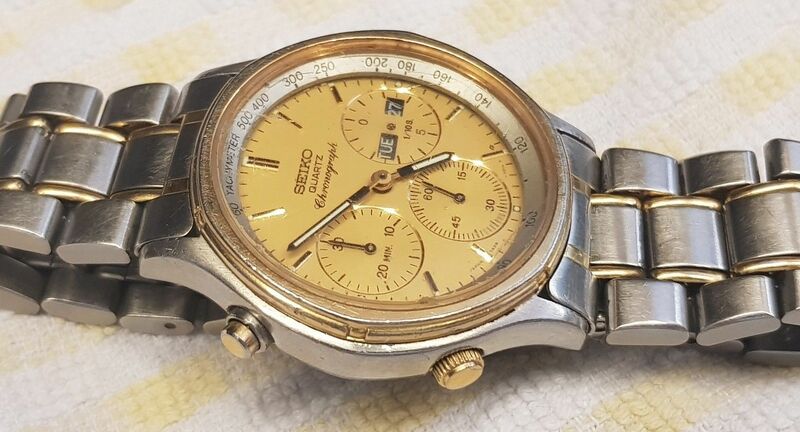 Good condition vintage Seiko Chronograph 7A38-7029, however light hairline scratches on the crystal, and a few scratches on the bezel at 6 o'clock. 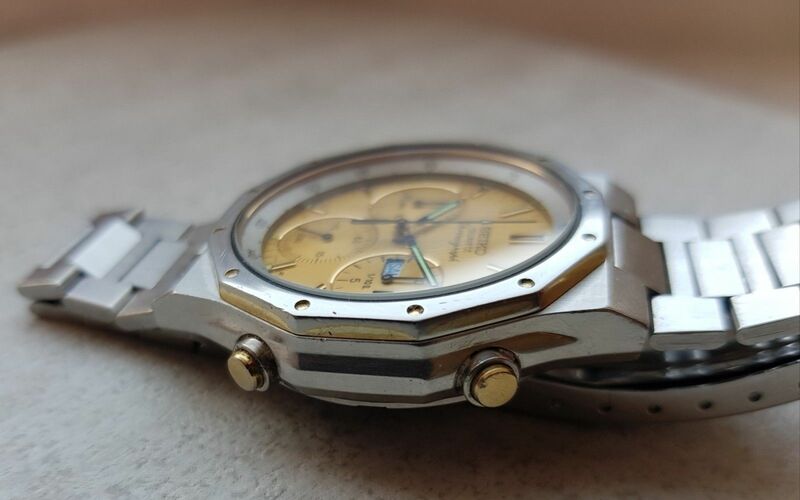 Keeps good time, however the chronograph minute sub-dial does not reset to zero, and the chronograph seconds sub-dial does not perfectly align with zero. The second reason was because I had a pretty good idea that it had been shill bid most of the way, to achieve that figure. 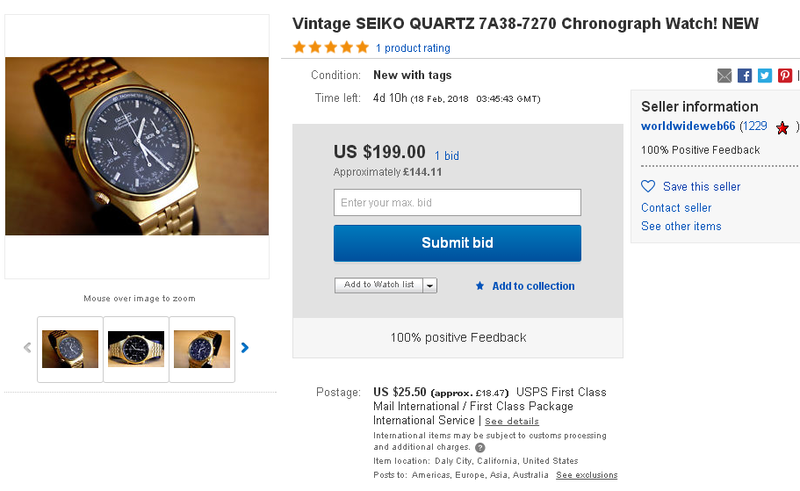 If you check the bidding history, it's not difficult to spot the Zero-feedback bidder, whose highest bid was $500 Au. 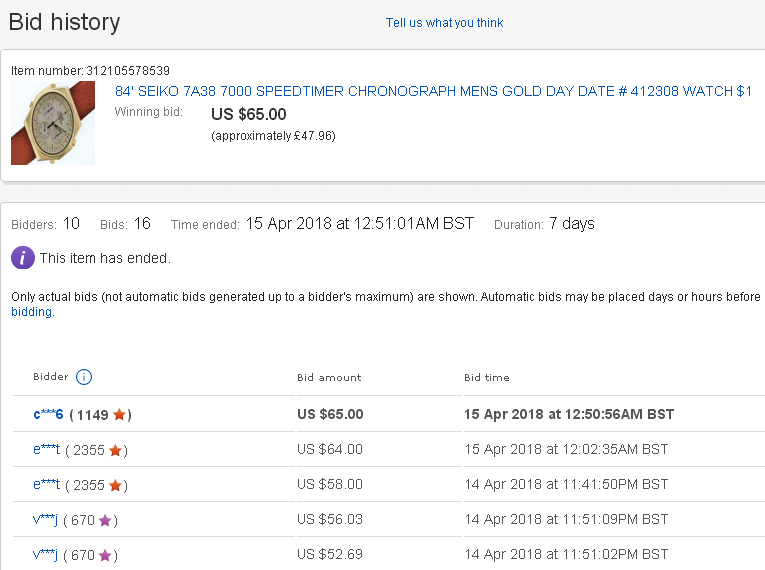 A good indication that a previous auction was shilled is when the item subsequently reappears, re-listed as it was in the early hours of this morning. This has been added to the description: Relisting as previous seller didn't pay. 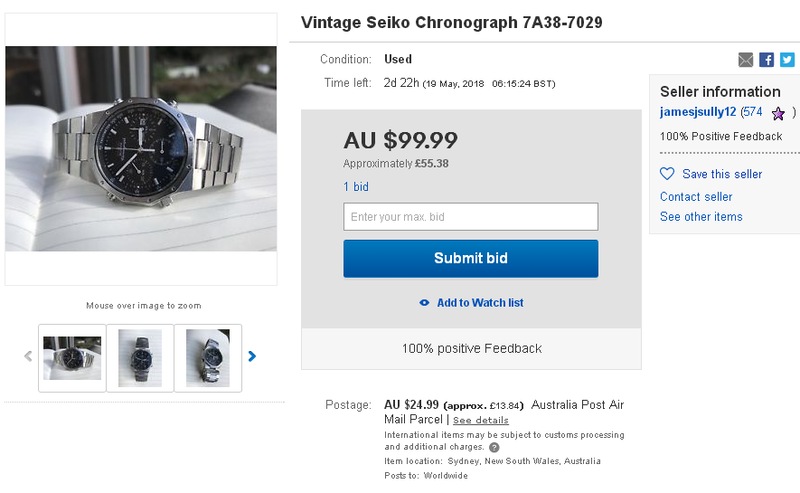 The Australian eBay seller's re-listed 3-day auction for that 7A38-7029 Franken ended in the early hours of this morning. This time it was (shill) bid to $405 Au. after 47 bids. Needless to say 10 of the later bids were placed by another newly created Zero-feedback bidder, who jacked the bidding up from $270 to $400. But it seems there's always some mug punter fool enough to bid higher. Carlo and I will undoubtedly continue to differ in our opinions as to what constitutes a 'Mod', versus a hastily cobbled together outright Franken - and probably for that matter - 'Art'. I handn't bothered to post the result of Carlo's eBay auction for that 7A38 / 7A34 Franken back in April, but now seems as opportune a time as any. 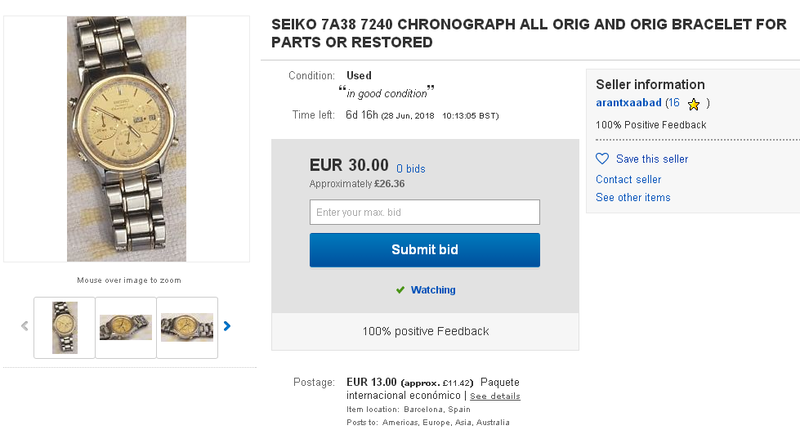 It theoretically sold for a mere 56 Euros after 3 bids. 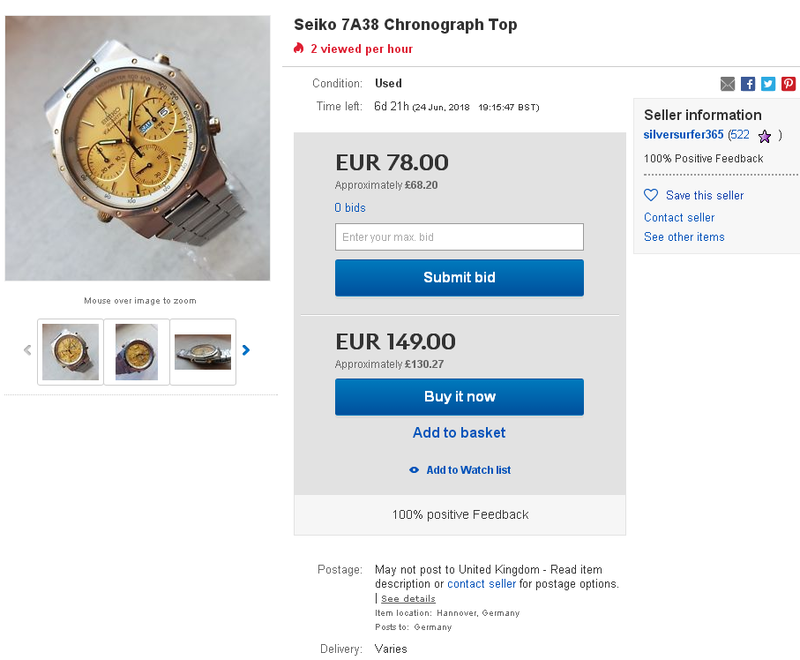 Personally, no matter how desparate for a 7A, I wouldn't even have paid that much for it ! The reason I'm posting it now, is that yesterday evening, Carlo listed 'another' Franken on eBay Germany, which in many respects looks very similar to the last one. 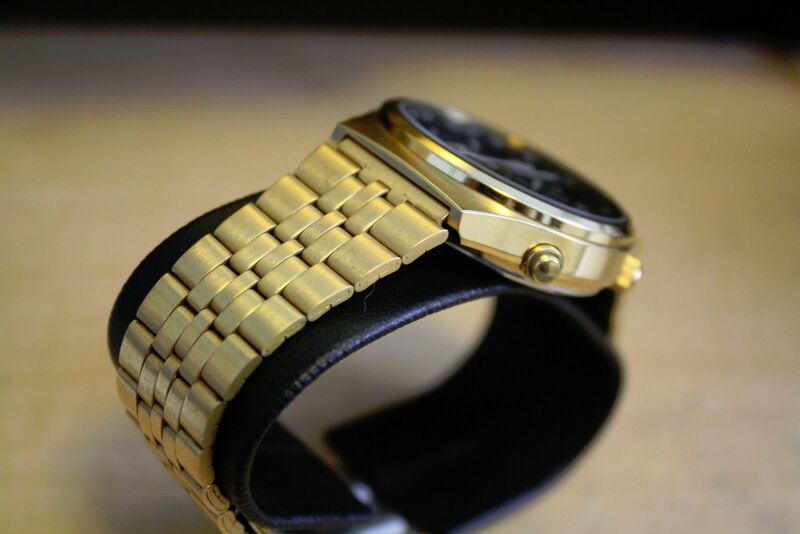 It uses a two-tone 7A38-7020 watch case whose bezel has been stripped of its gold plating and polished. 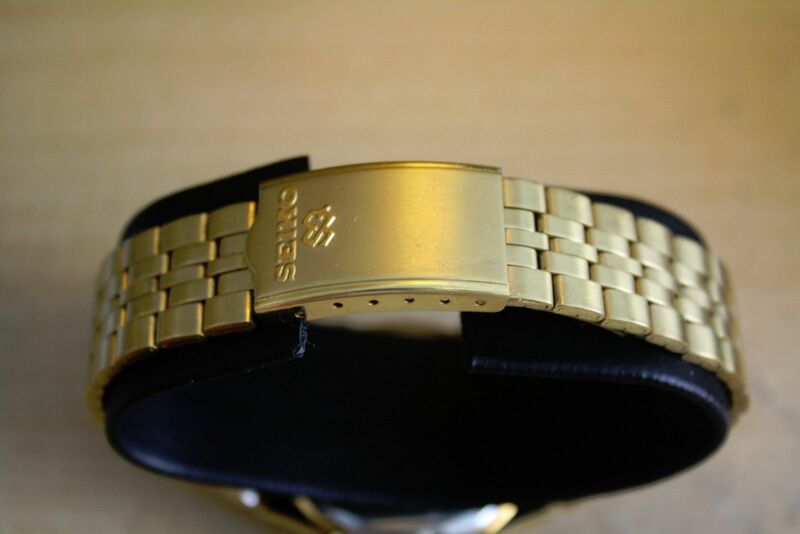 It is fitted with a remarkably similar looking, if not identical non-original Seiko bracelet. 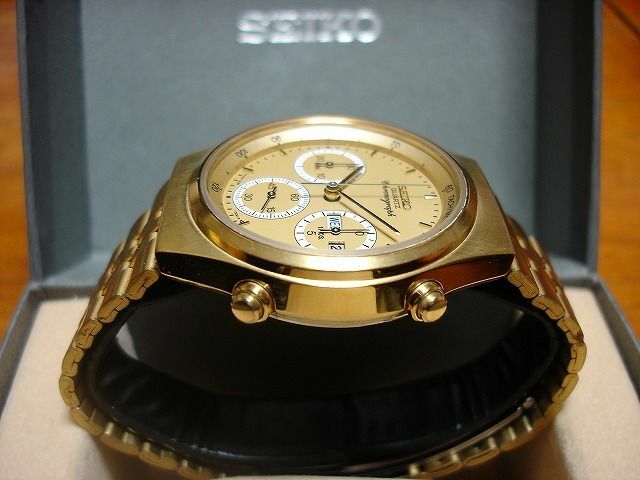 But this one is fitted with the gold 701L dial and movement from a gold-tone 7A38-7000. Hang on a minute - a closer examination of the two sets photos, reaveals that this is basically exactly the same watch, now fitted with a different dial / movement ! 7A38- 7020 , circa 40 mm breit ohne Krone, langes Band und volle Funktion von Uhr und Chronographenzeiger. 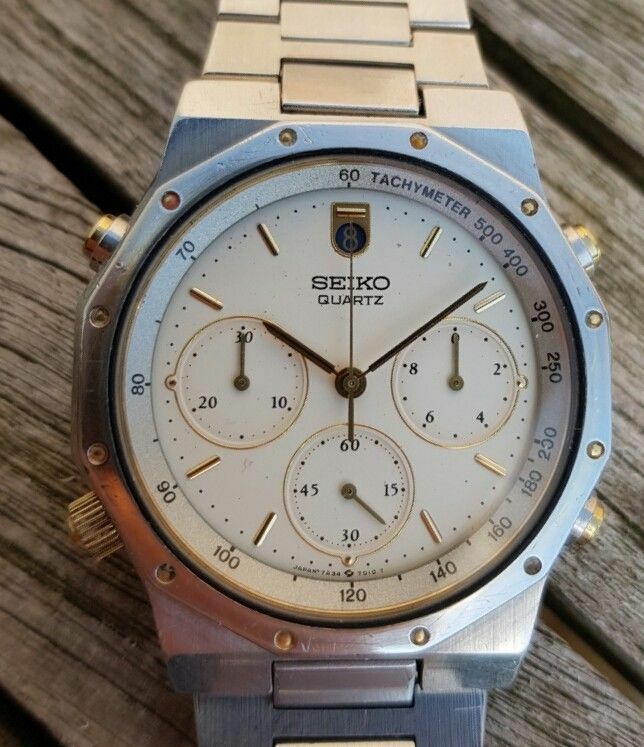 Tolles sauberes Werk, Gehäuse 7020 Mod mit 5000er Ziffernblatt in bestem Zustand mit Seiko SQ Stahlband. 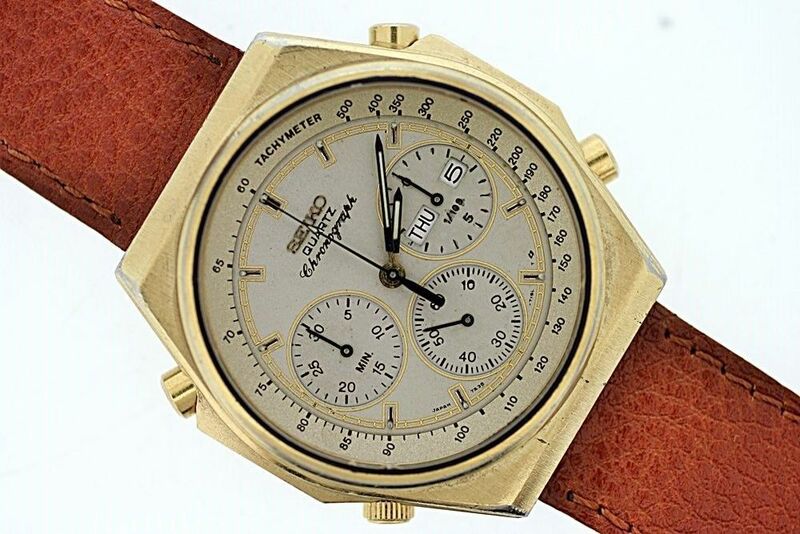 Analoger QuartzChronograph der ersten Stunde. Versand nur D und Nachbarländer. 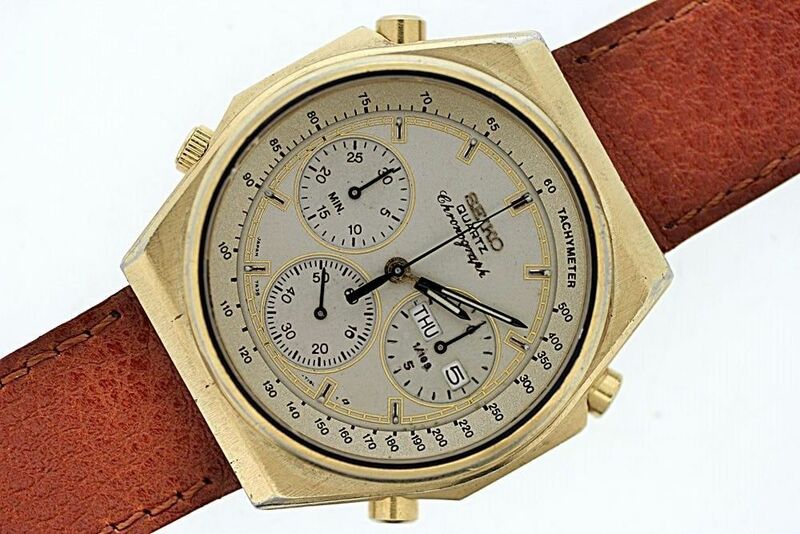 Just purely by coincidence, naturally, Carlo also happened to have listed another Franken based on a well worn two-tone 7A38-7280, that's fitted with a 7A34 dial and movement. Now I wonder where that could possibly have come from ? 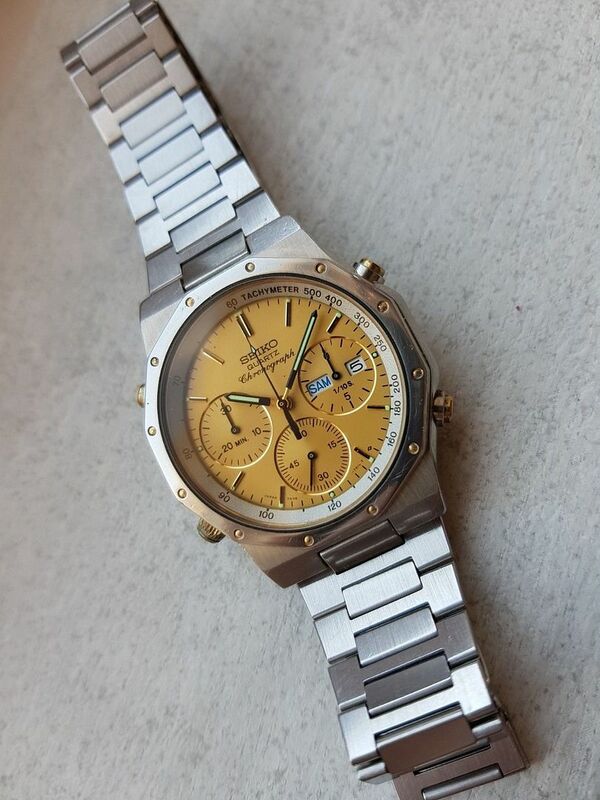 Seiko 7A38 Mod mit 34er Werk. 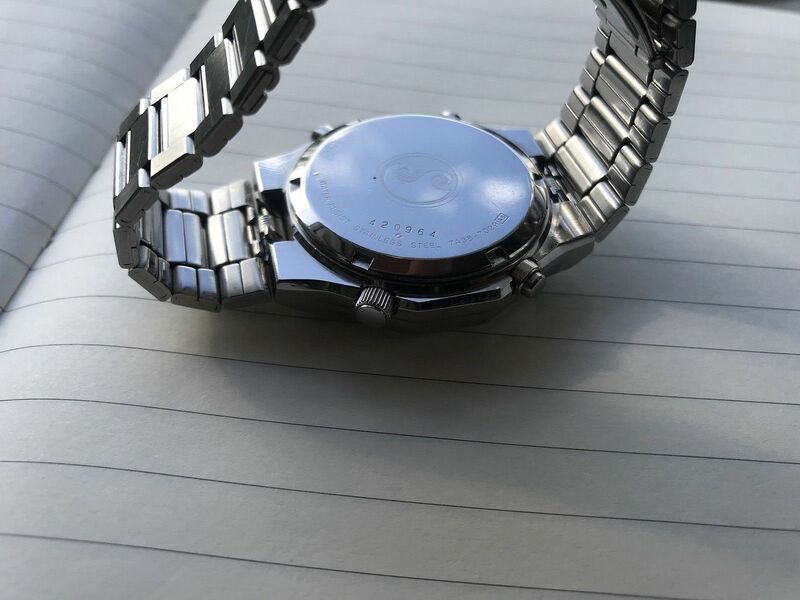 Uhr volle Funktion, Chronographen-Funktionen halbwegs bis wenig gegeben, auch der Drücker auf 10 Uhr hängt. Quasi für Uhrmacher oder Bastler als teildefekt. Uhrzeit läuft sehr genau, Datum schaltet sauber. 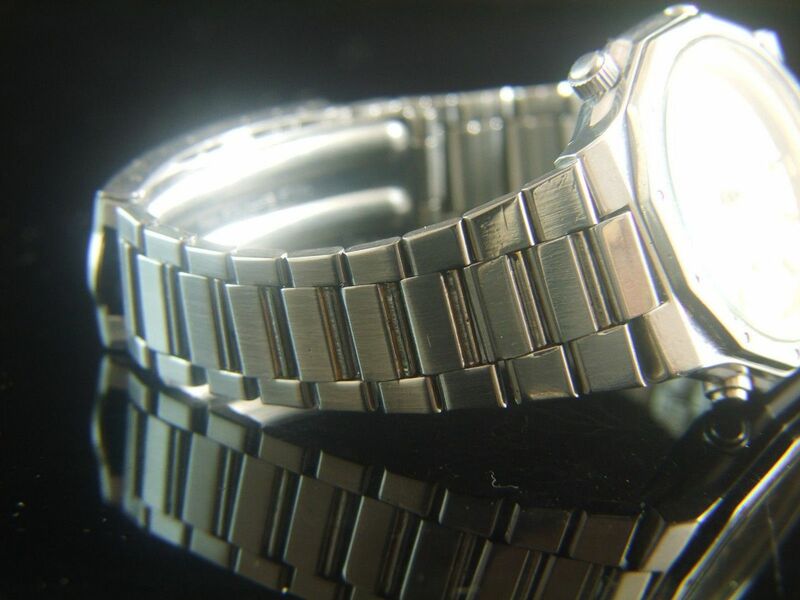 Breite ohne Krone 38 mm circa. Gute Bandlänge, original Band mit Tragespuren und Abrieb. So the title I'd orginally given this topic turns out to be rather apt in this case. PS - Give it up Carlo and chuck the parts back in your scrap bin. 'Cos you're obviously not very good at it ! Here's another instance of Déjà Vu. It could almost be laughable, it wasn't quite so pathetic. 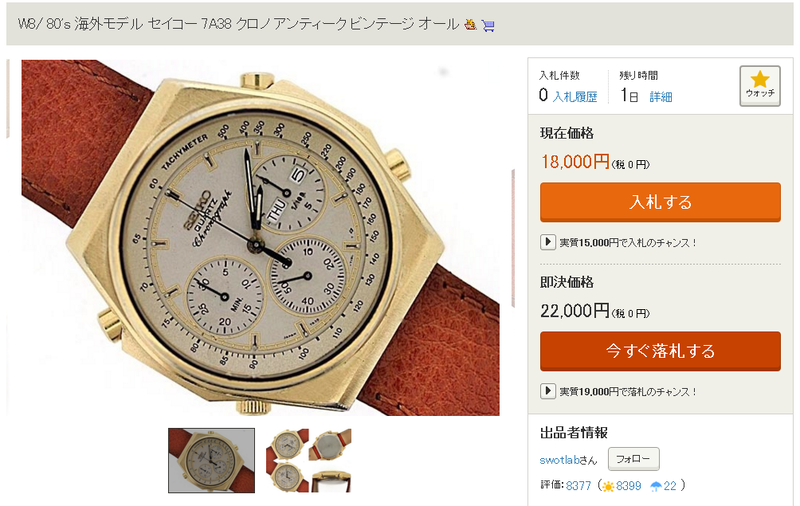 A prime example of the blatant greed of the would-be profiteering Japanese re-seller. Or someone with short term memory loss. It's covered in some detail higher up this page. 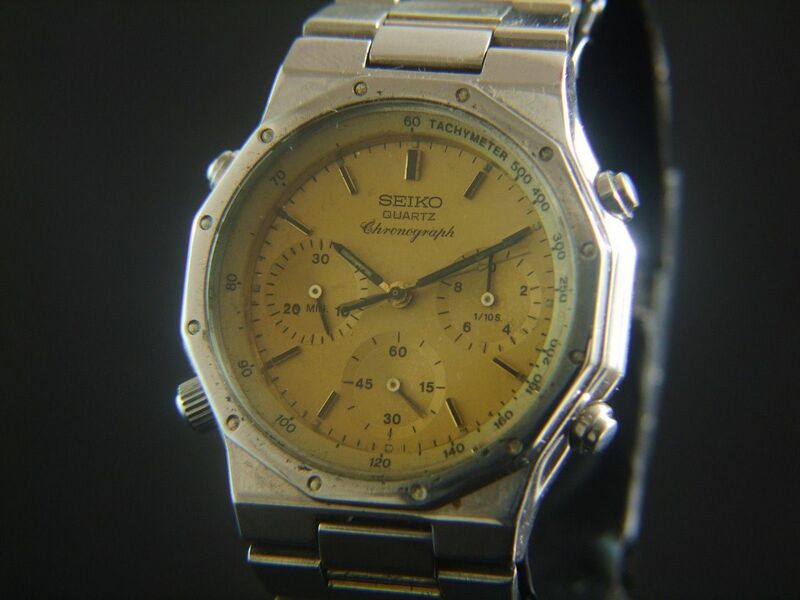 Needless to say Swotlab hasn't had any success in off-loading the ex-eBay ex-restoredwatches 7A38-7000 cased Franken over on Yahoo Japan. He continues to re-list it on an almost daily basis. So what should turn up in my eBay searches early this morning - asking $300 ? Hard to believe he still hasn't even bothered to take any of his own photos. Just in case anyone needed reminding what he paid for this ex-Filipino Franken piece of junk, a little over two months ago, back in mid-April - $65. Some people clearly have no idea of the true meaning of the word 'original'. 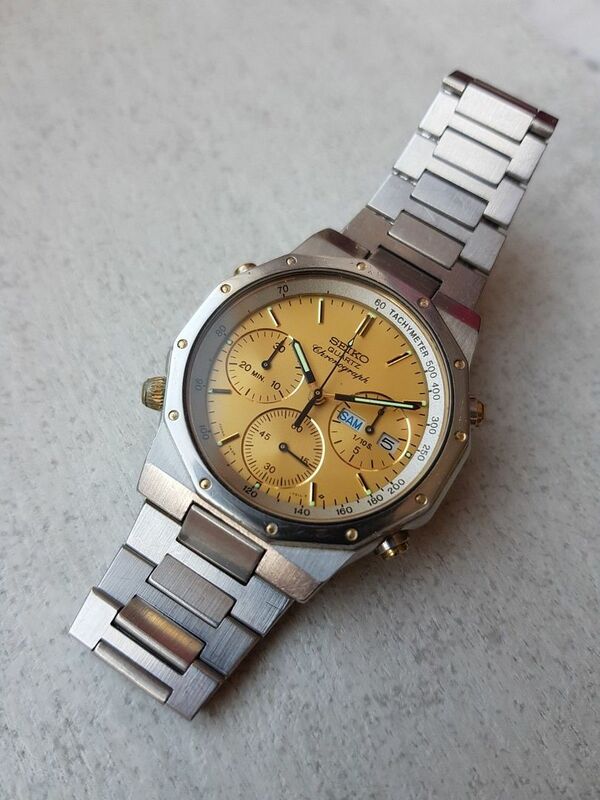 This Franken piece of junk was listed yesterday by a Spanish eBay seller, purporting to be an all-original 7A38-7240 on an an original bracelet. Yeah right. 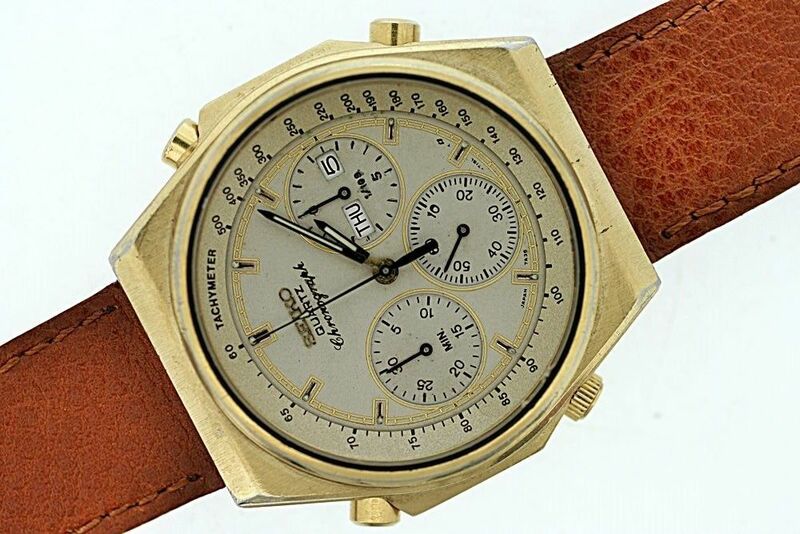 About all that's genuinely original to the original 7A38-7240 is the two-tone watch case. 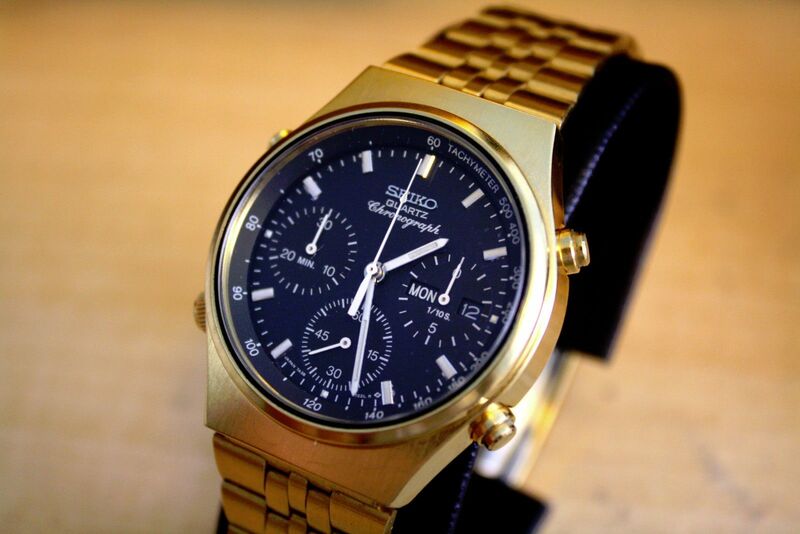 Once again, the gold 701L dial is from a gold-tone 7A38-7000. 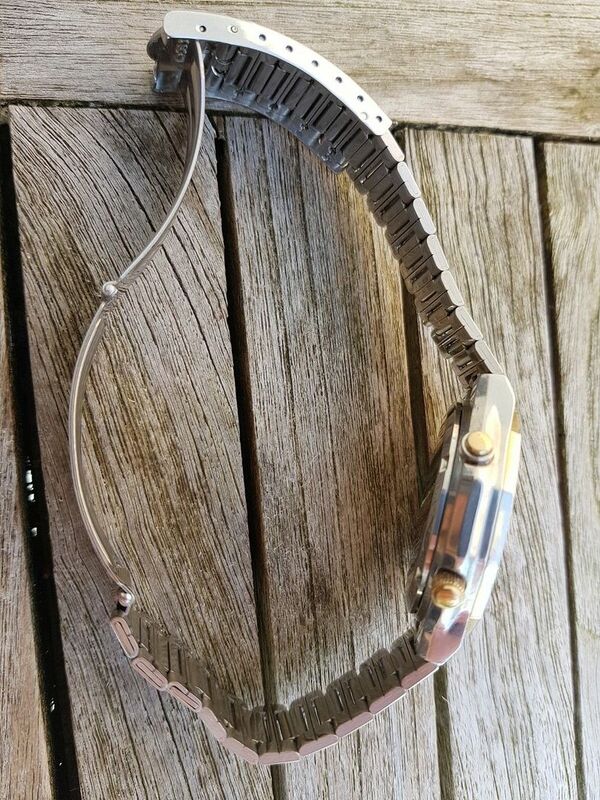 The bracelet could be off anything - a 7T32 or maybe even a Seiko '5'. Pay pal solo para comparadores extranjeros. Si se desea entrega y pago en barcelona capital. No se cual es el problema ...se vende así. No pujes si no lo tienes claro. No hay devolucion por eso si tienes dudas mándame un email responderé a la mayor brevedad posible. I dont know why not working ...sorry. If you have a question send me a email. I've just been going through my eBay watching page, clearing out some of the cr@p I'd added to it, to make room for more over-priced misrepresented cr@p that I have absolutely no intention of bidding on, let alone buying. 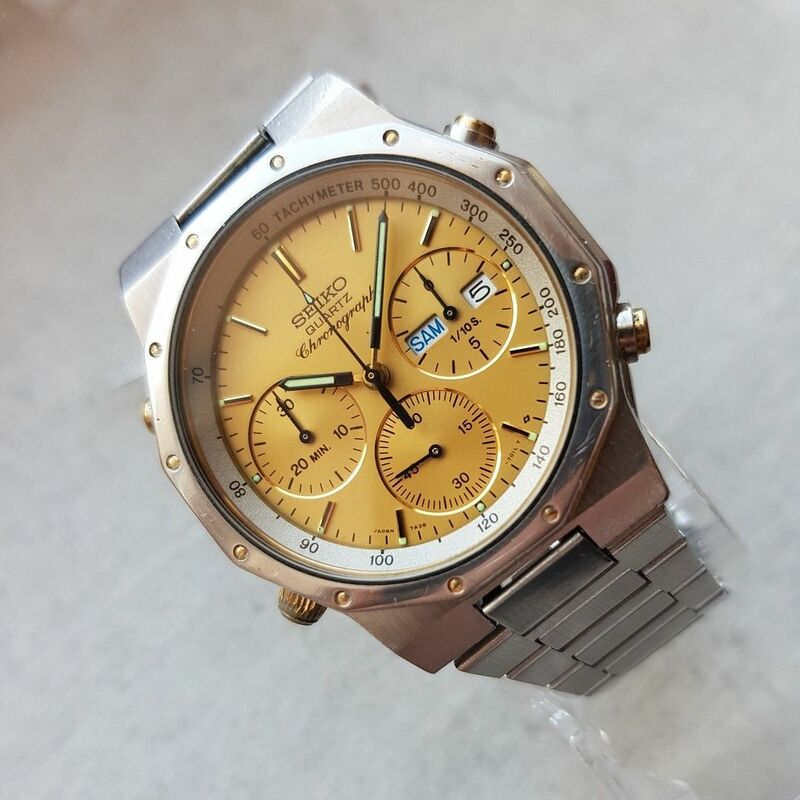 I noticed that horrible ex-Filipino gold-tone 7A38-7000 Franken, listed by Japanese profiteeering re-seller swotlab (or should I more correctly say another of his alter ego's) had been ended by the seller, last week, because it was no longer available. Then I checked Yahoo Japan and found it had disappeared off there too. 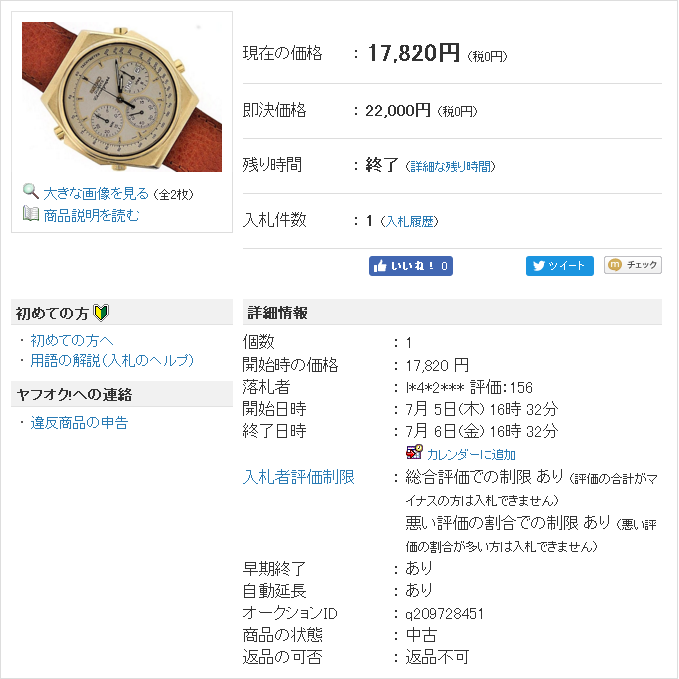 Seems someone had actually bought it, paying the 17,820 Yen opening bid price. As I've said many times: all it ever takes is one numpty !